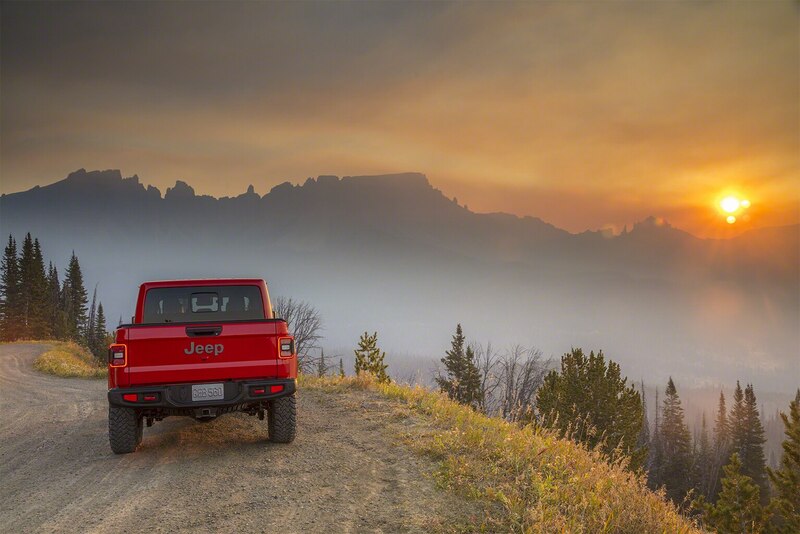 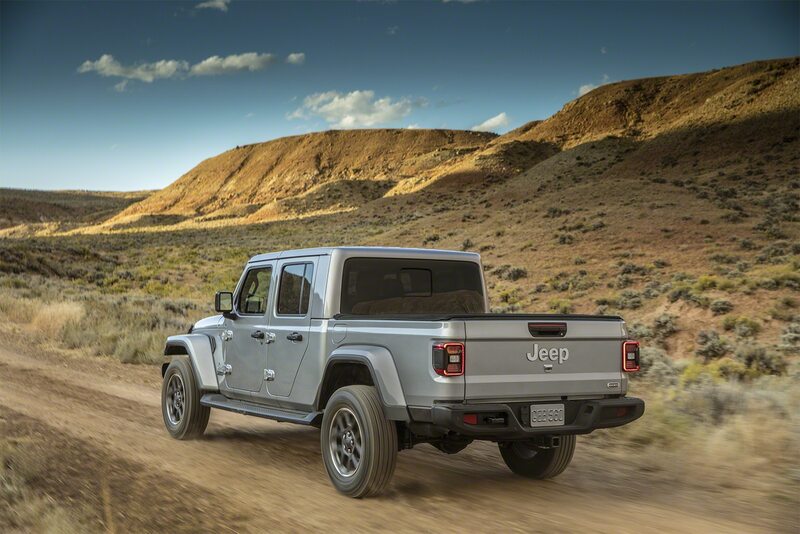 With Jeep having previously confirmed that it is calling its new pickup truck the Gladiator, you’ve by now heard (or made) all the references to Peter Graves’s toss-away line in “Airplane”—“Joey, do you like trucks called the Gladiator?”—and resolved yourself to the brand’s rationale for resurrecting the name. 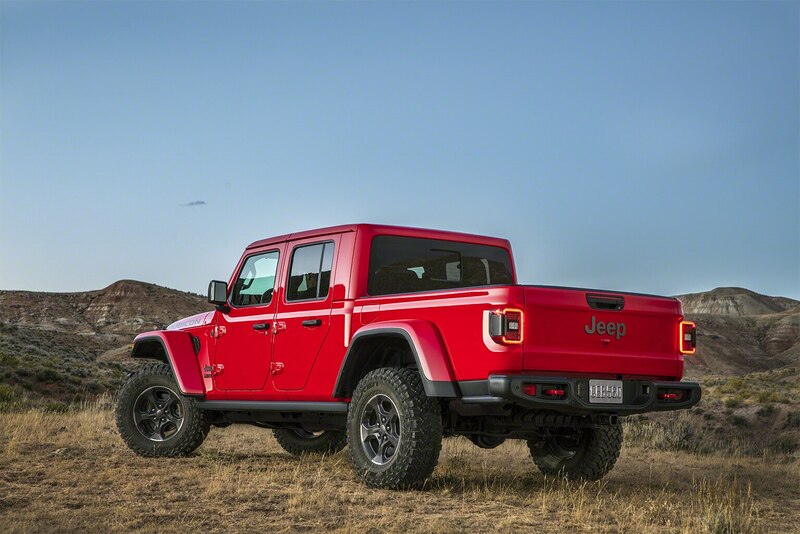 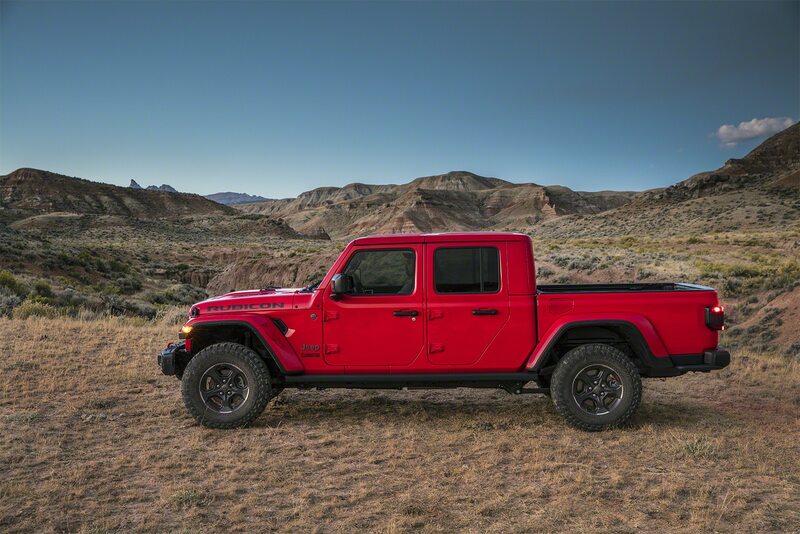 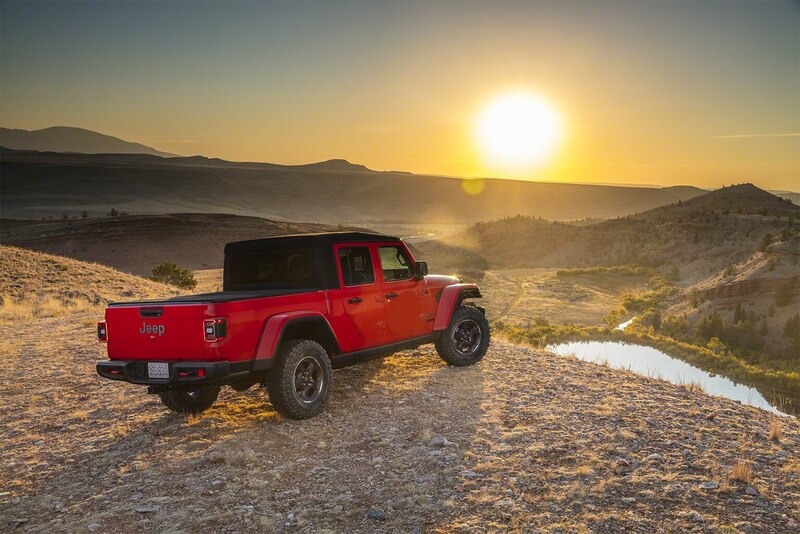 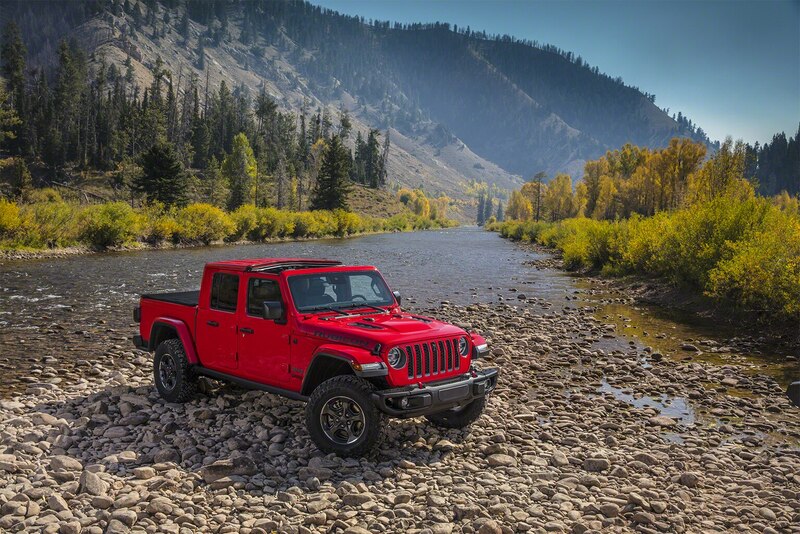 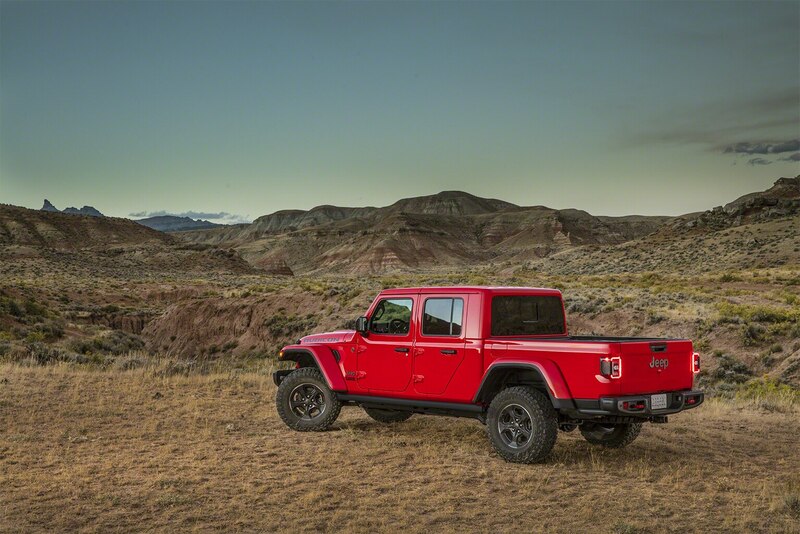 There was, says Jeep design chief Mark Allen, “a little bit of reluctance to call it a Wrangler truck.” Indeed, Jeep has a history of separate nameplates for its pickups, including Gladiator, Scrambler (which had been rumored to get the nod), and Comanche. 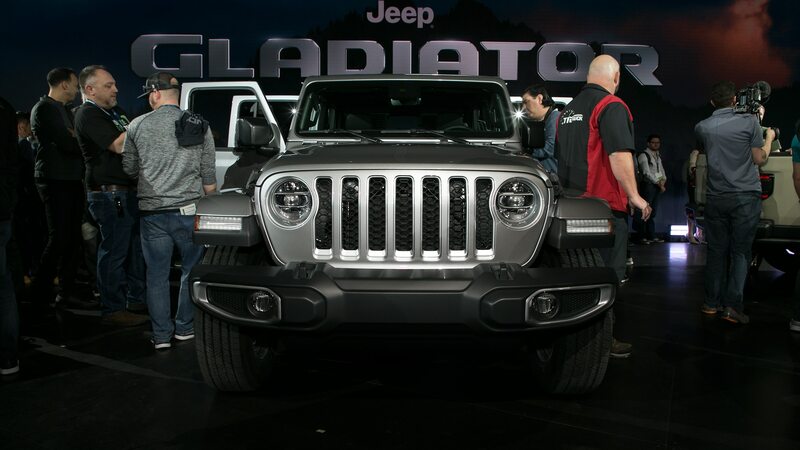 Gladiator traces back to the 1962–71 Wagoneer-based truck, was used on a 2005 concept, and as a production model has now made its debut at the Los Angeles Auto Show ahead of a second-quarter 2019 market launch. 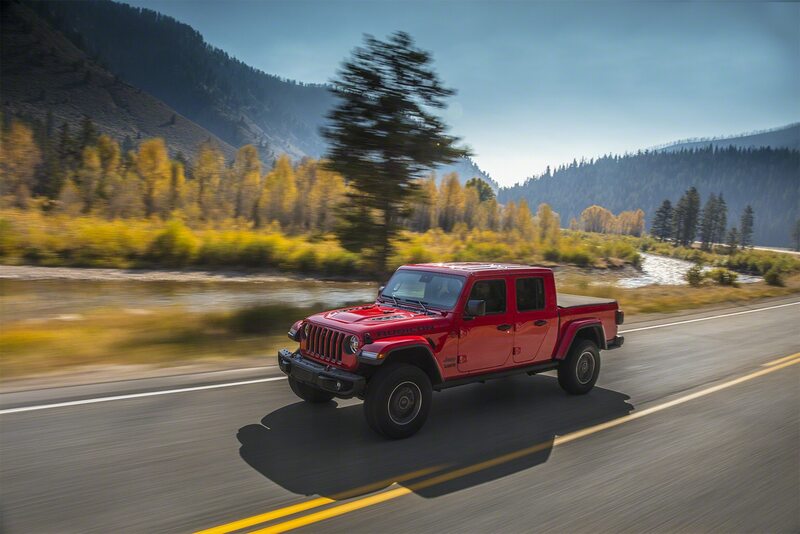 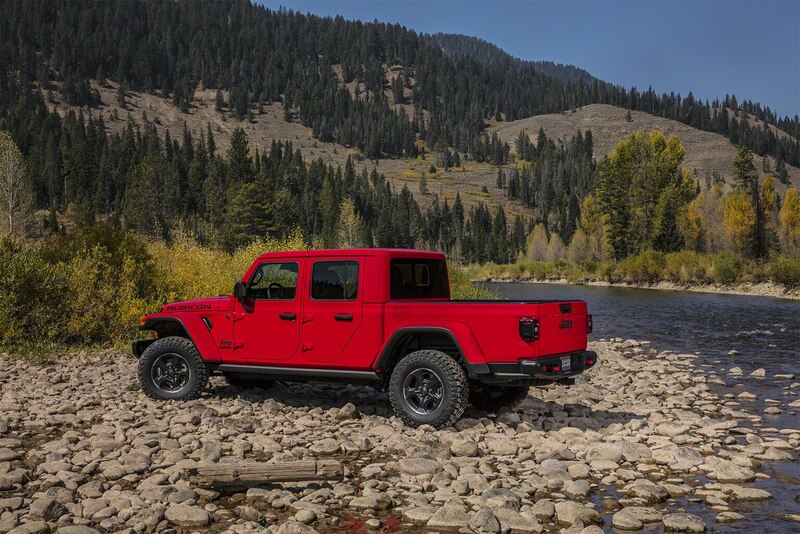 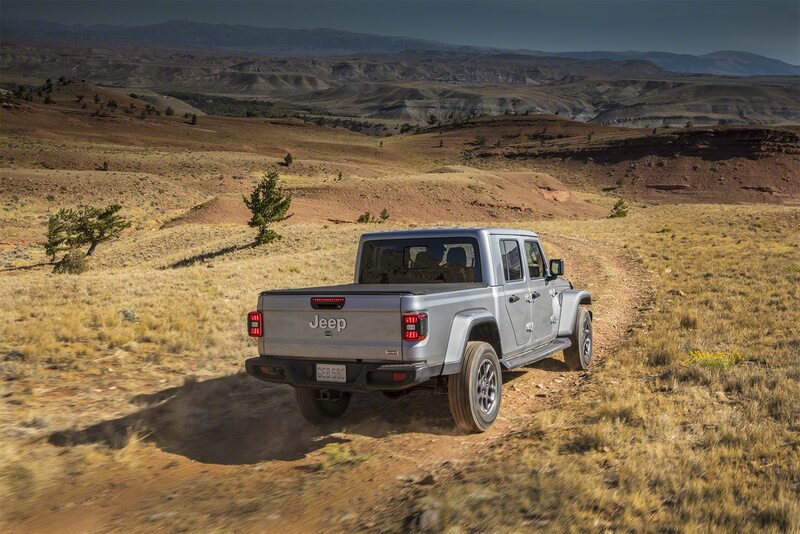 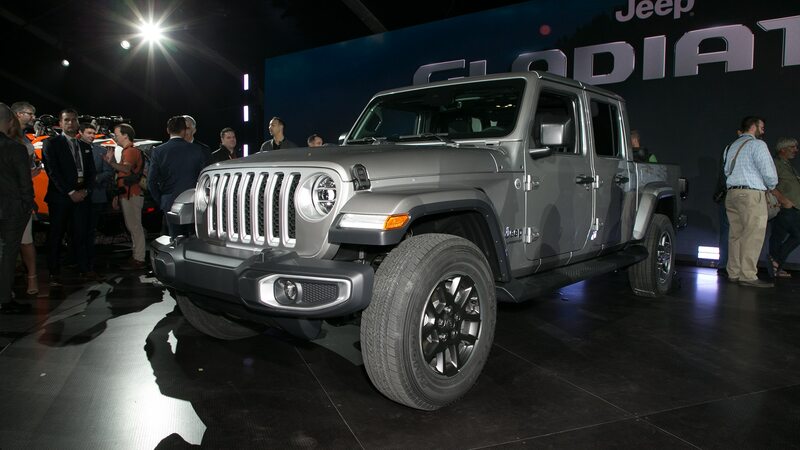 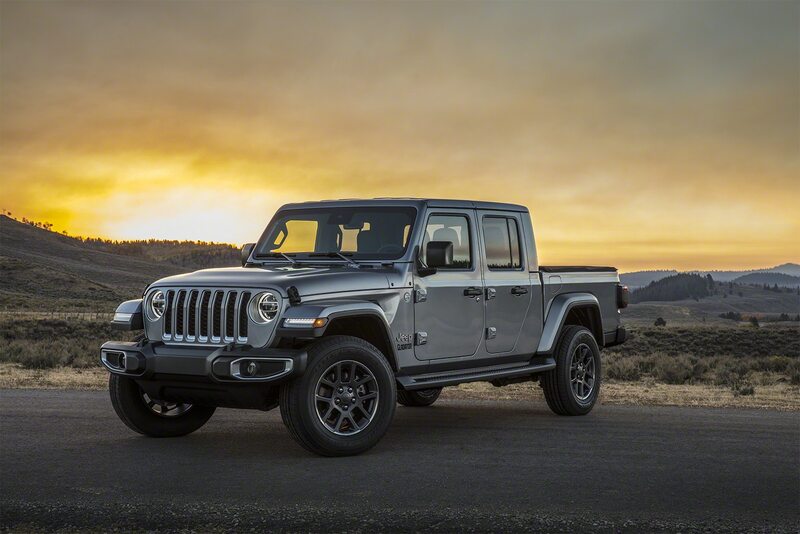 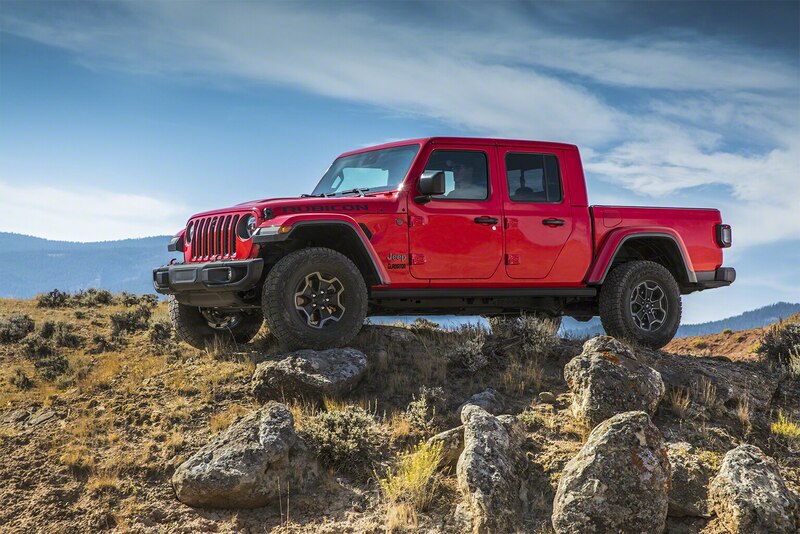 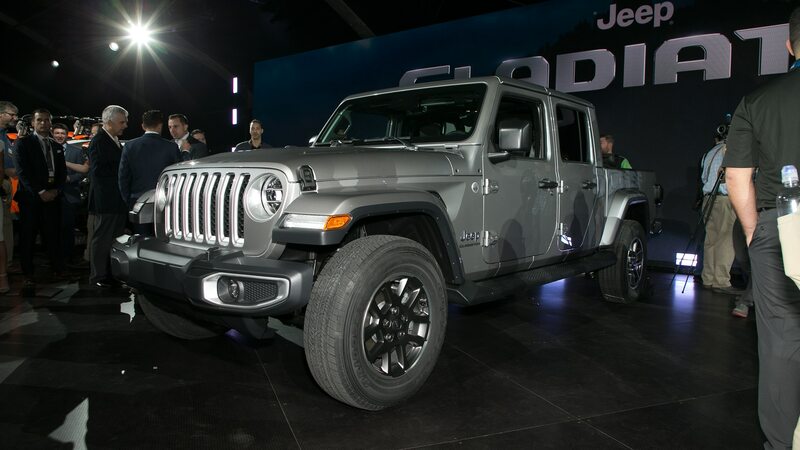 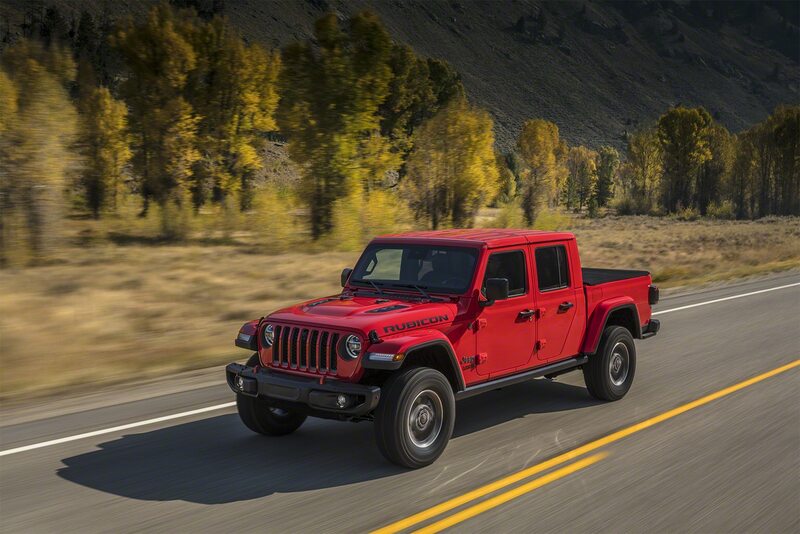 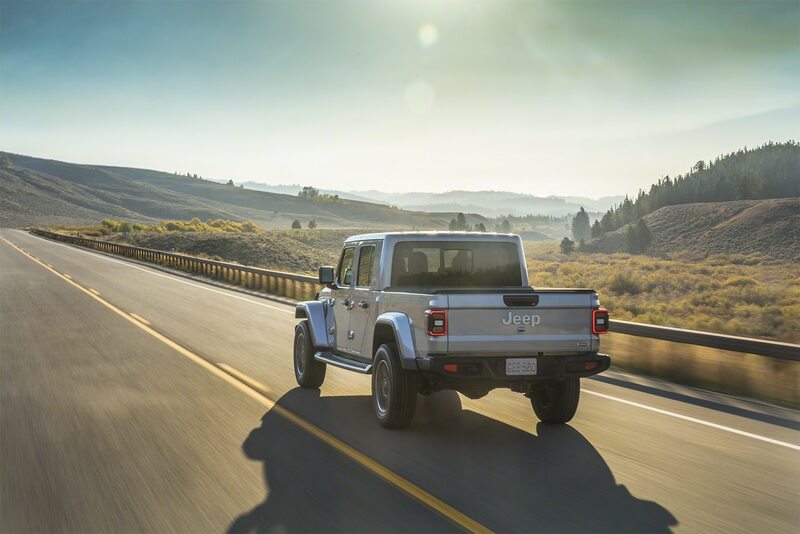 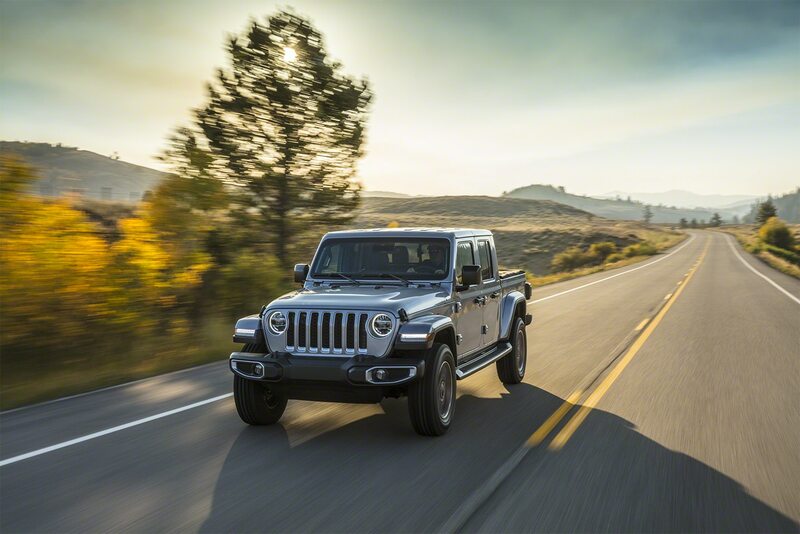 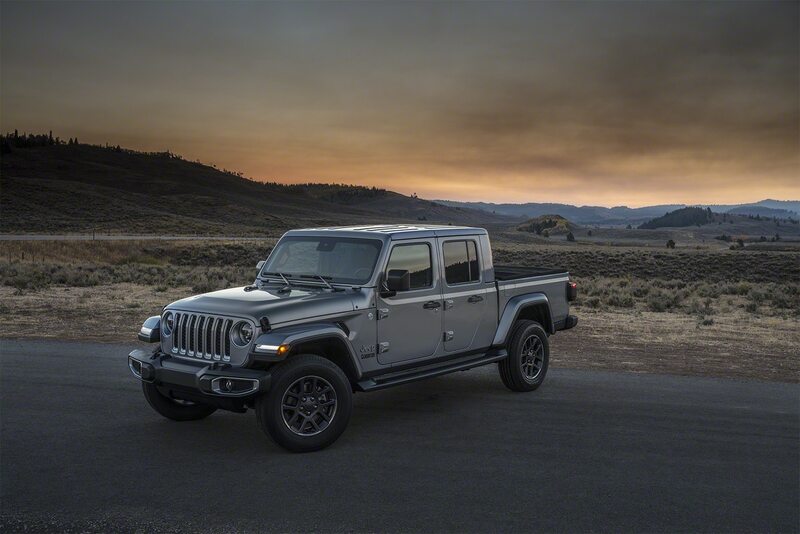 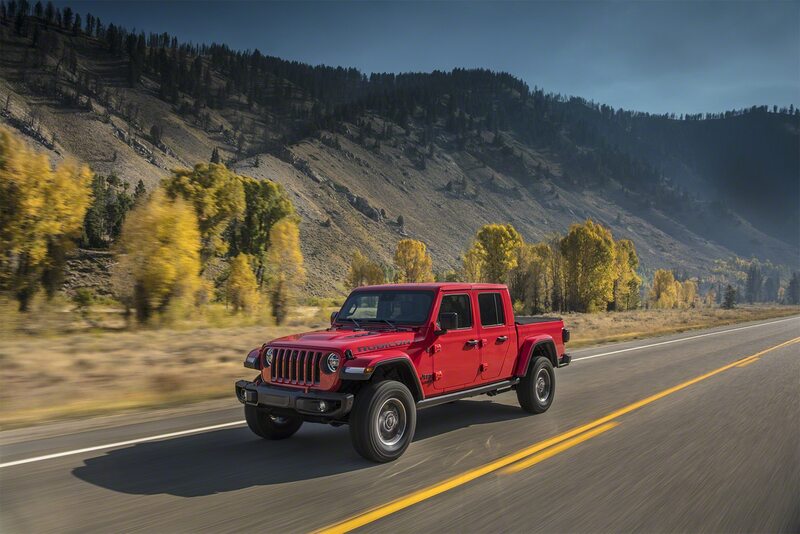 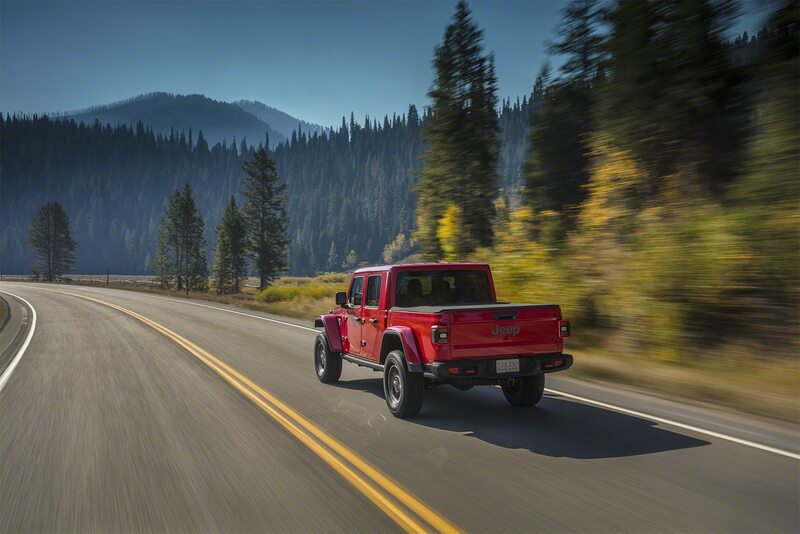 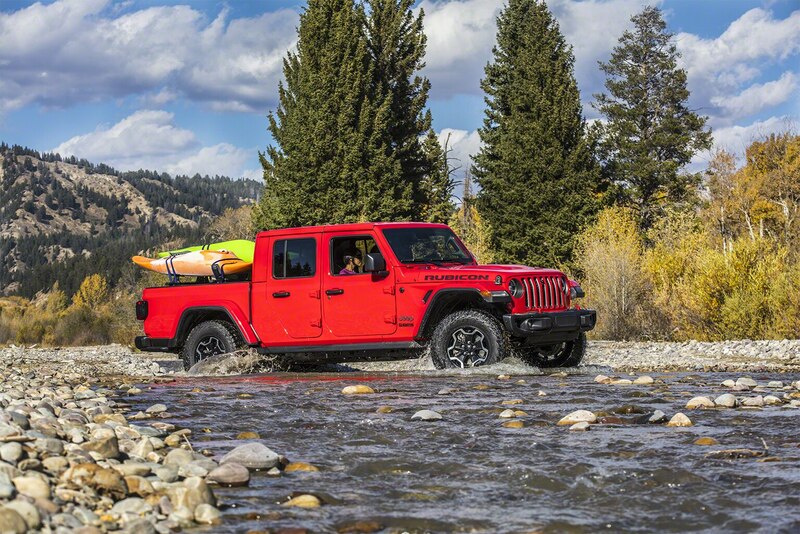 The 2020 Jeep Gladiator shares its body from the C-pillar forward with the Wrangler Unlimited, but not all of its underpinnings. 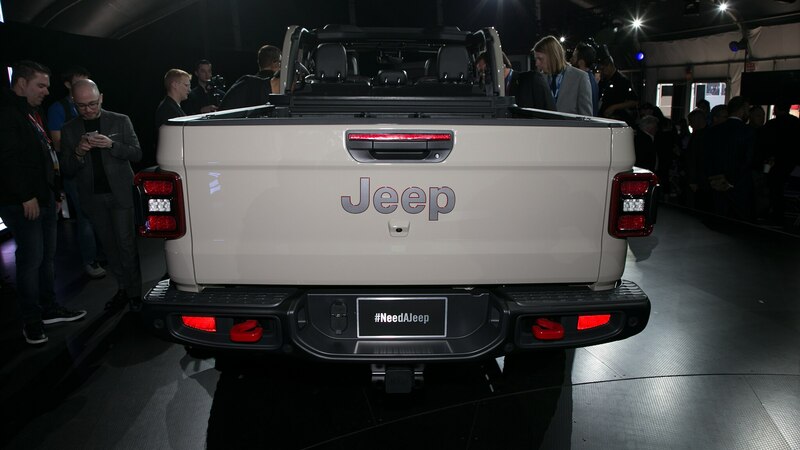 While the pickup truck’s front suspension is identical to the Wrangler’s solid front axle with coil springs, the rear has a five-link coil-spring setup in place of trailing arms, with two upper and two lower forged steel control arms for longitudinal control, and a track bar for lateral control of the axle. 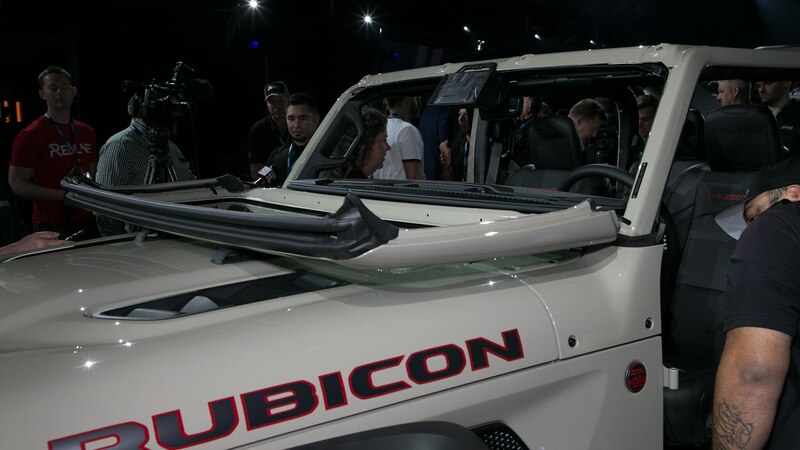 The control arms are located under the frame rails, and the rear shocks are forward facing for more consistent damping, Jeep says. 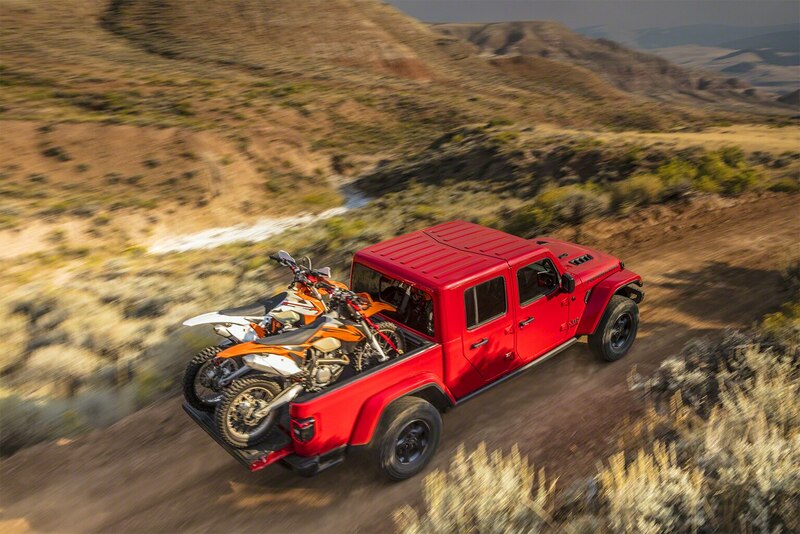 The rear suspension design is borrowed from the new Ram 1500 pickup, which has a wheelbase 3.2 inches longer than the Gladiator’s. 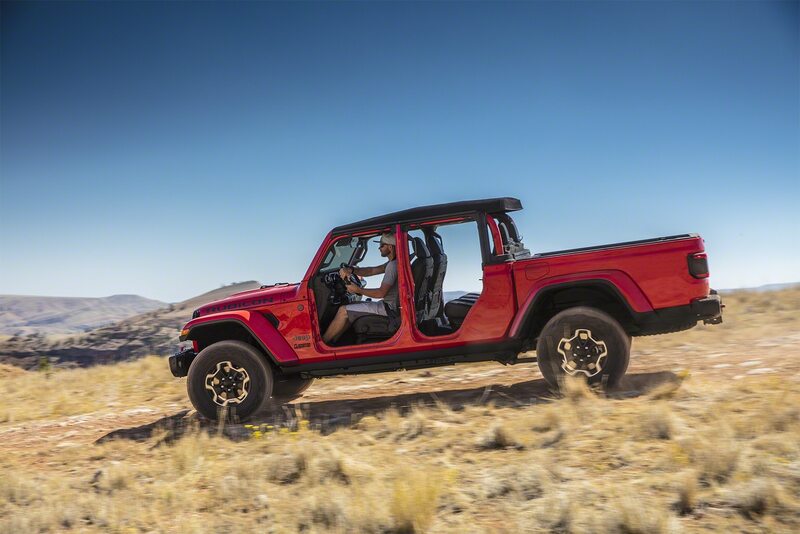 For its part, Jeep says the Gladiator’s frame is unique to the model. 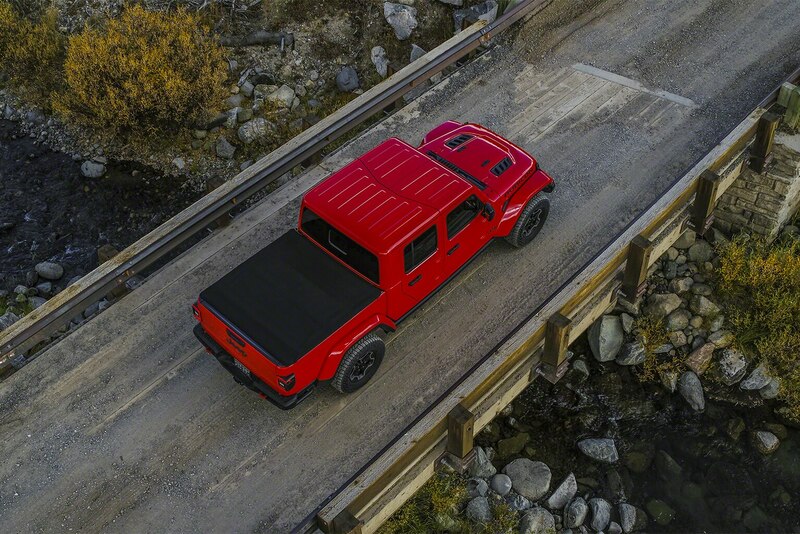 At 218.0 inches long, the truck is 29.6 inches longer than the Unlimited, which itself is 19.6 inches longer than the two-door JL Wrangler. 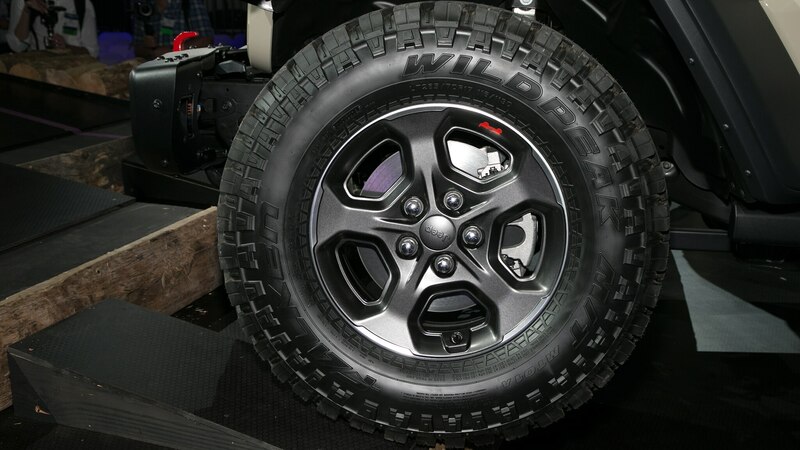 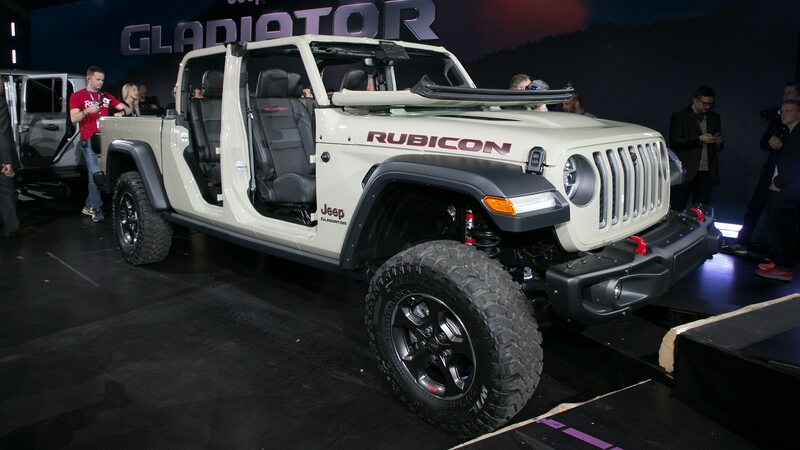 The Gladiator’s wheelbase gets 19.4 of those additional inches, standing at 137.3 inches. 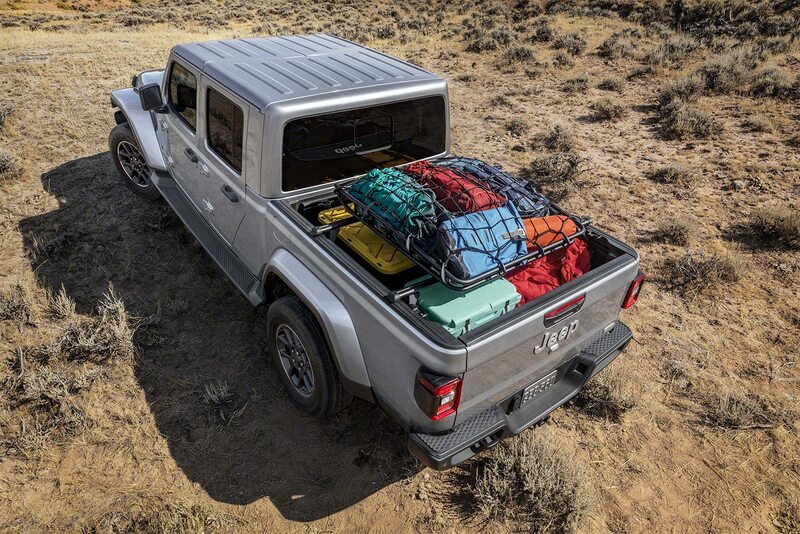 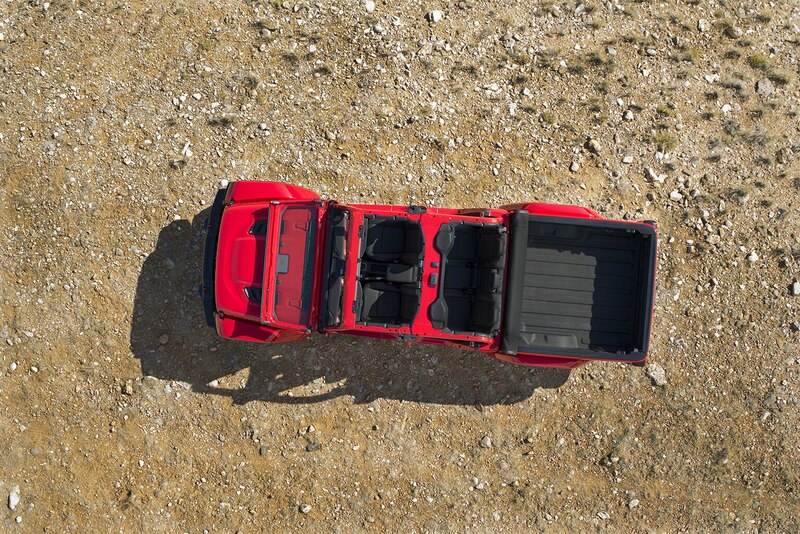 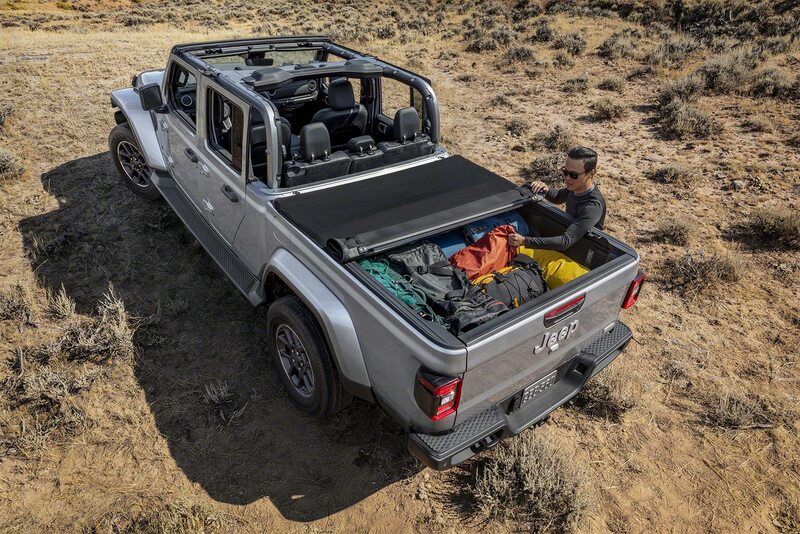 The five-foot pickup box will be available with a spray-in bedliner, as well as a soft, roll-up tonneau with a small slit in back so you can slip in a 2×4 without fussing with it. 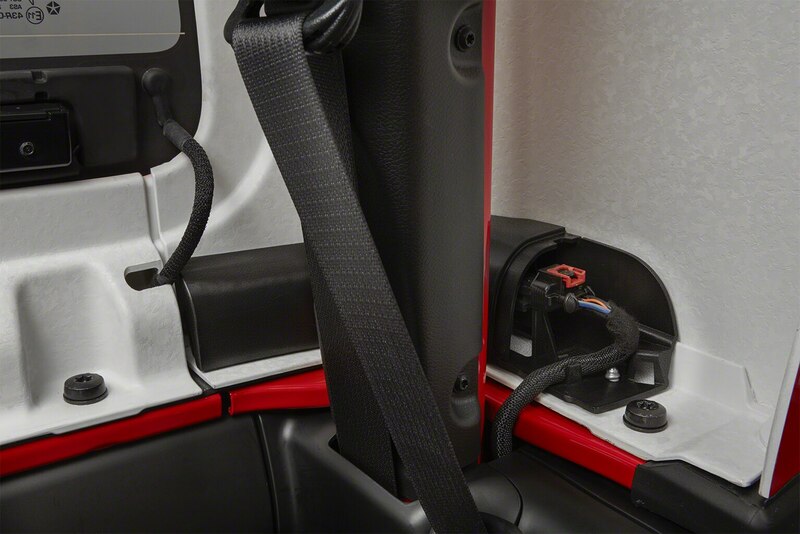 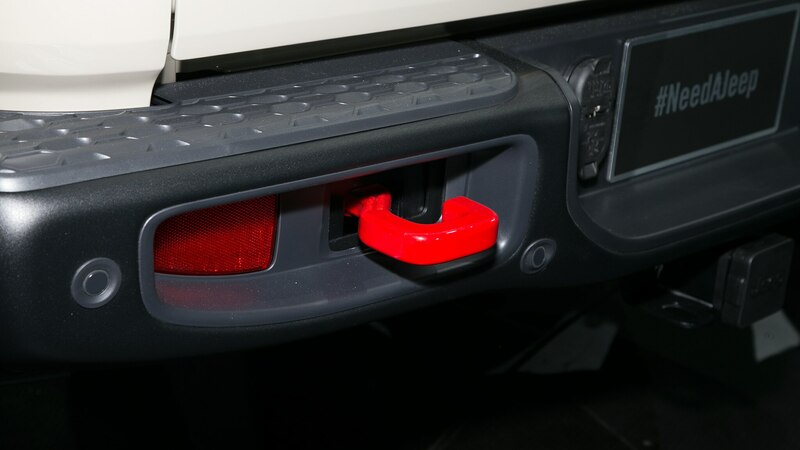 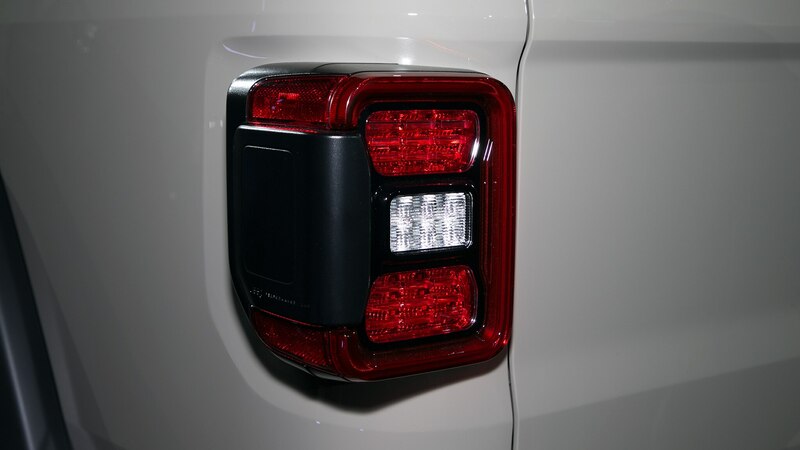 There are aluminum extrusions with cleats for tie-downs, in-bed LED lighting and an optional 115-volt power outlet. 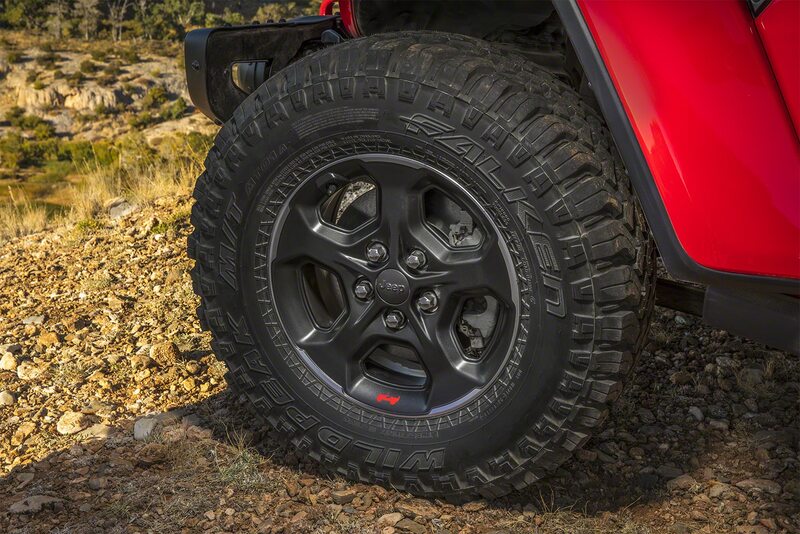 The spare tire has been moved underneath, and there’s room for aftermarket 37-inch tires, if you want to replace the factory 35s. 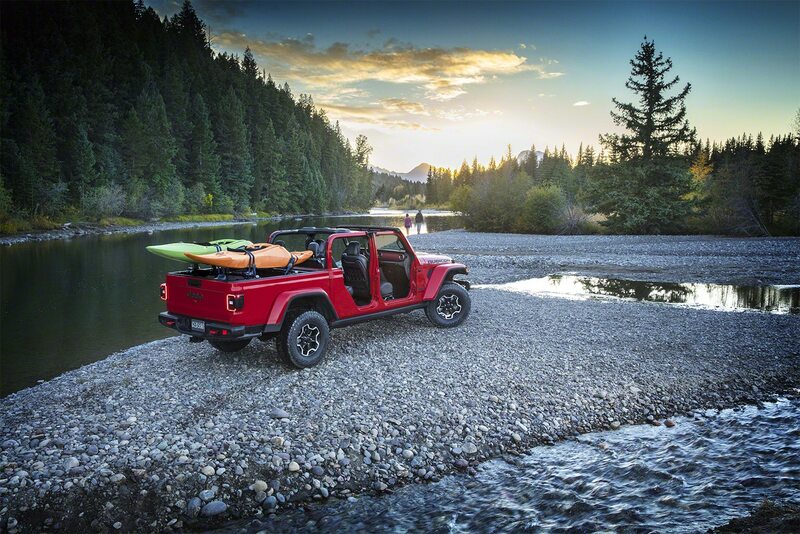 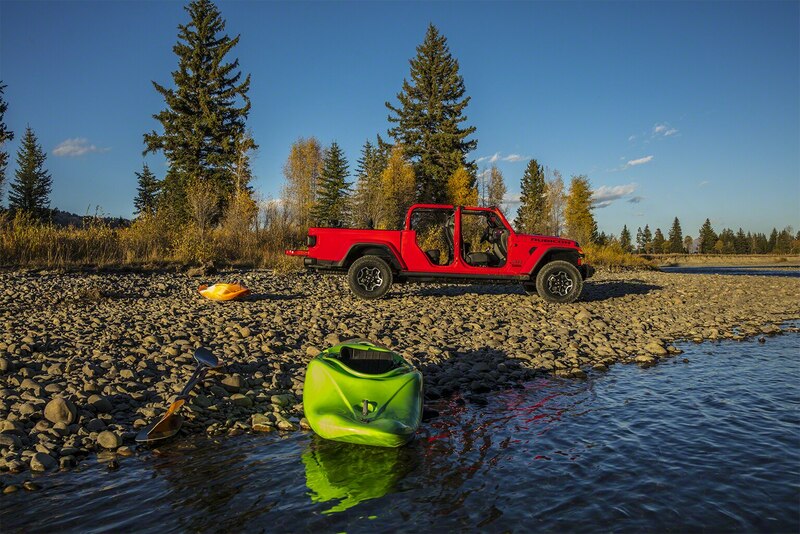 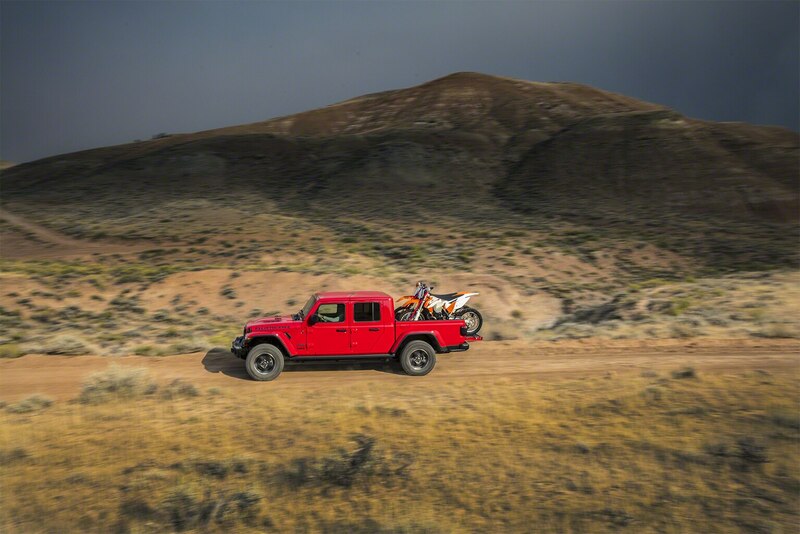 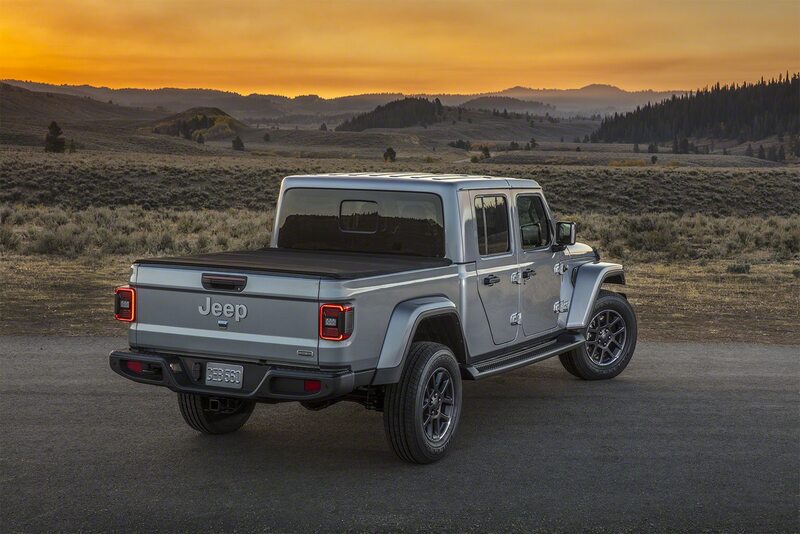 Jeep considers the Gladiator a “lifestyle” pickup truck good for hauling motorcycles, bicycles, and kayaks rather than for hitting the work sites. 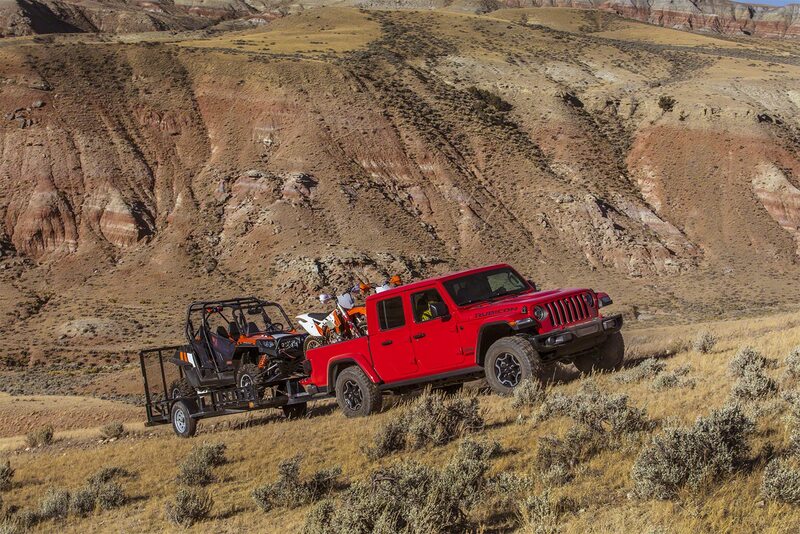 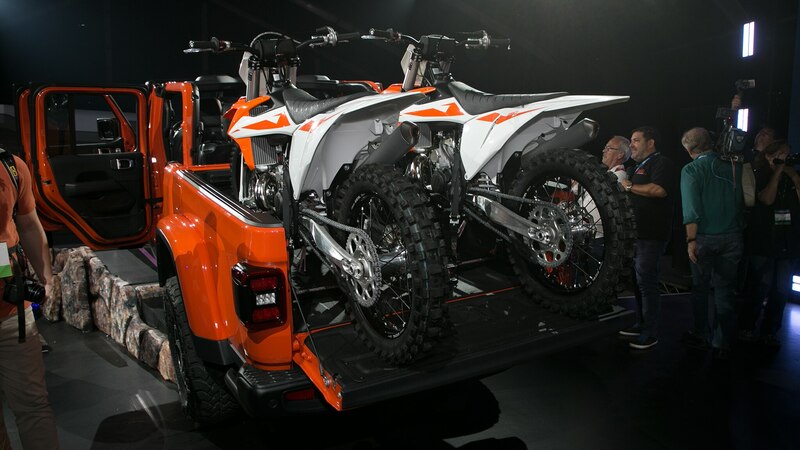 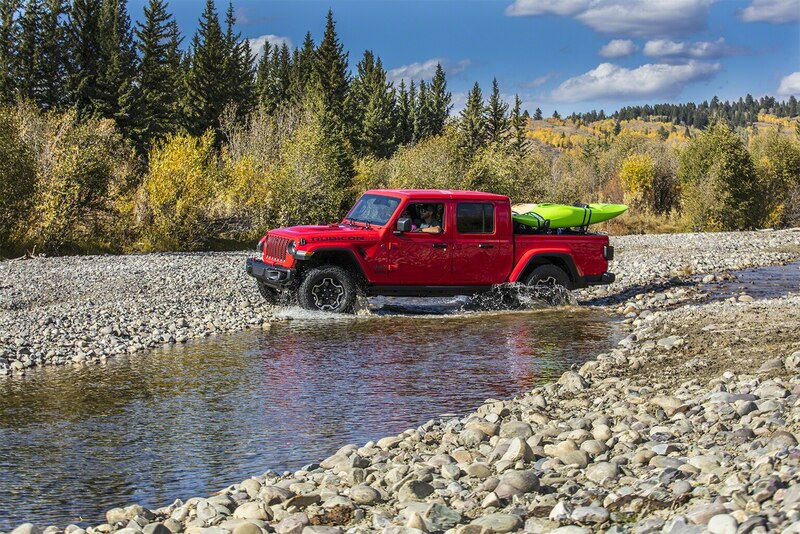 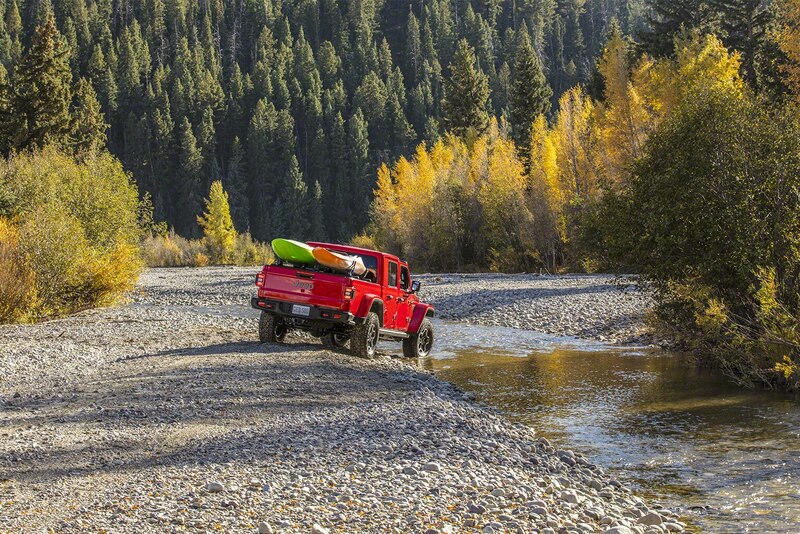 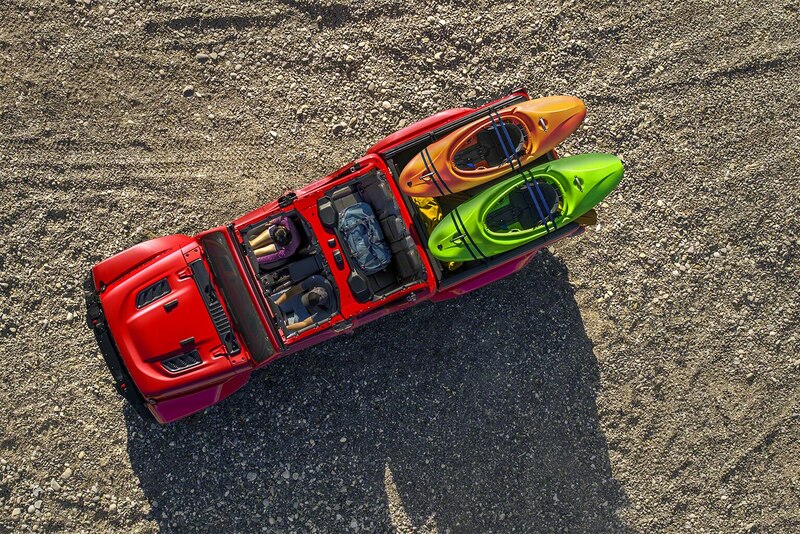 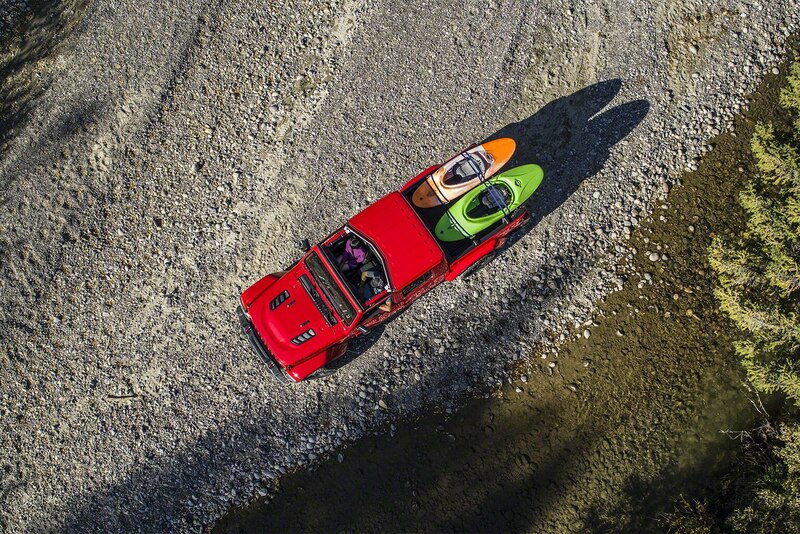 It surely will handle hauling extra gear on your next Moab expedition. 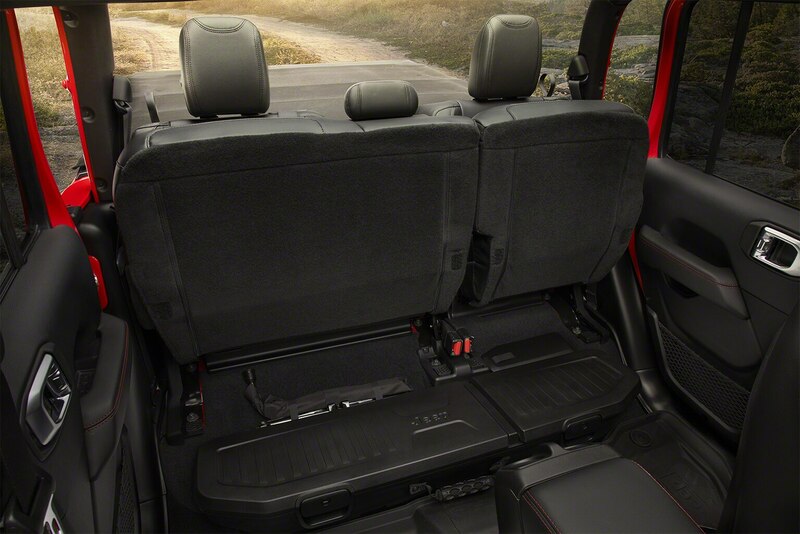 Most of the interior layout is the same, at least from the front seats forward. 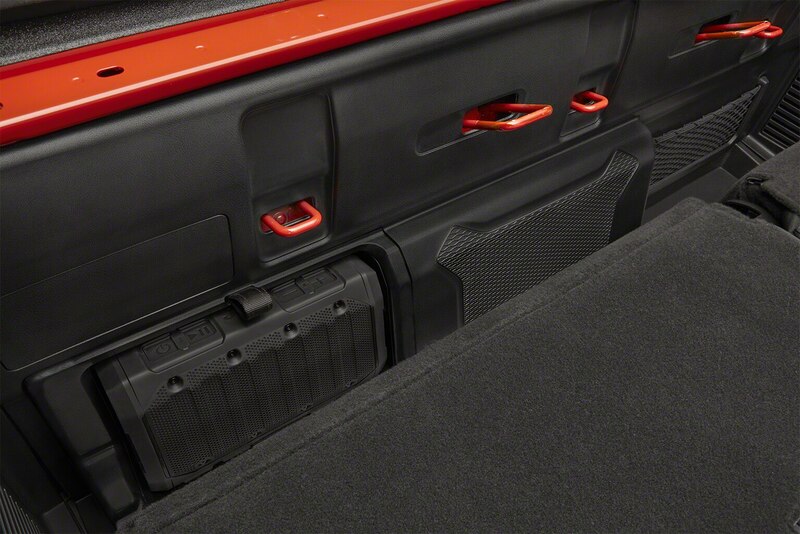 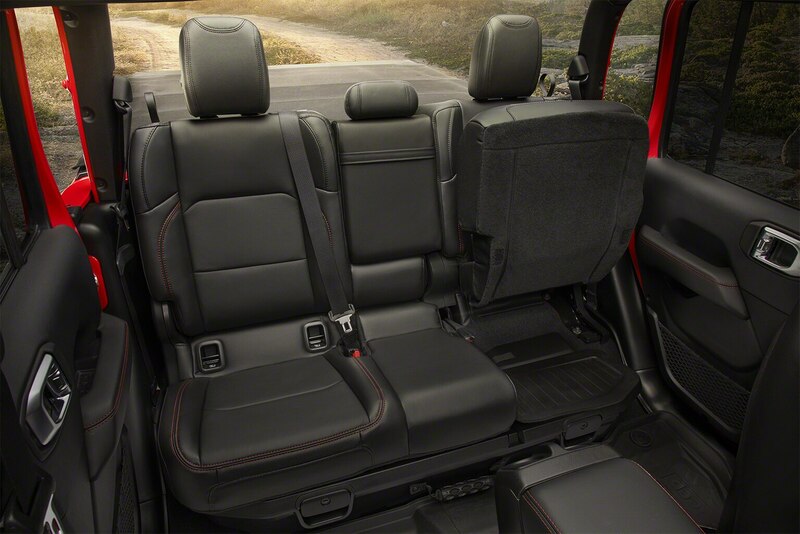 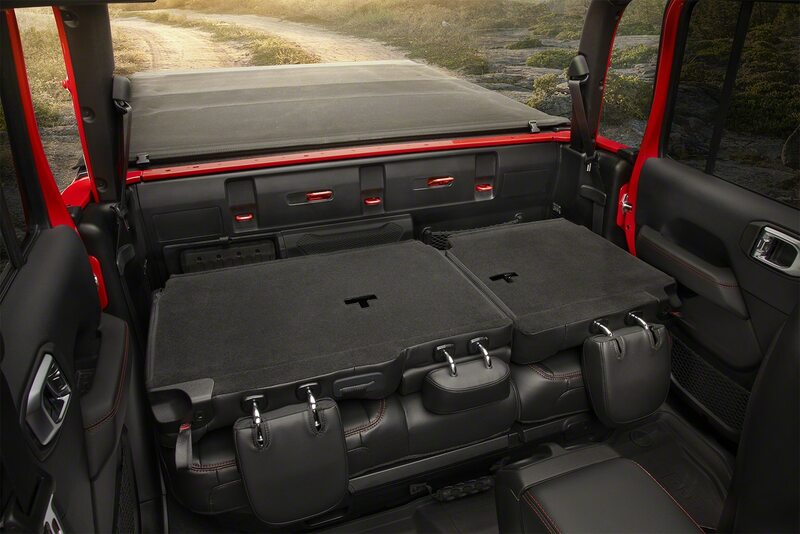 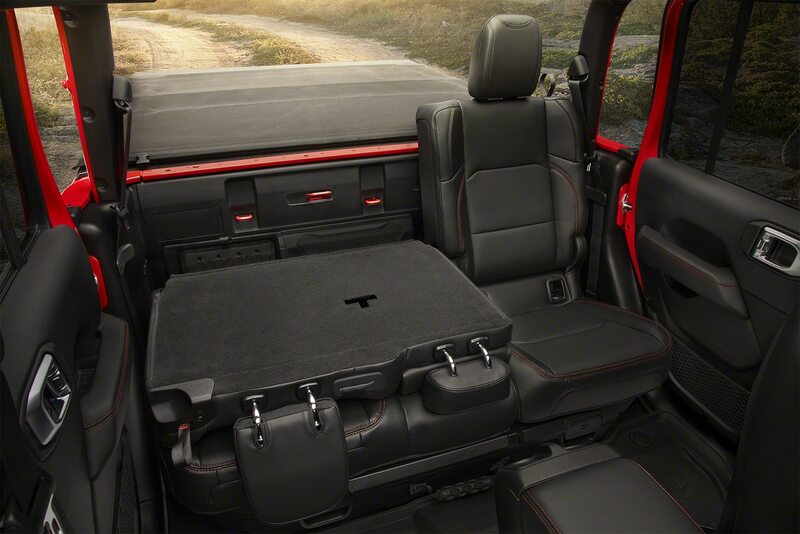 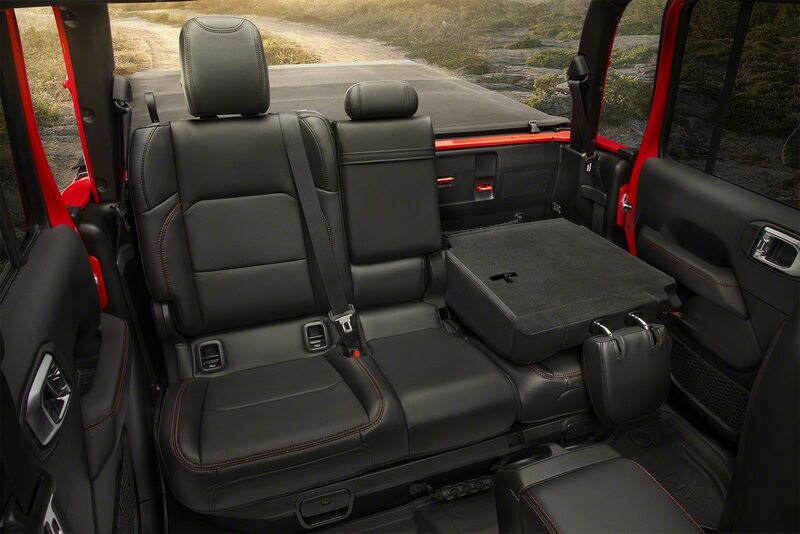 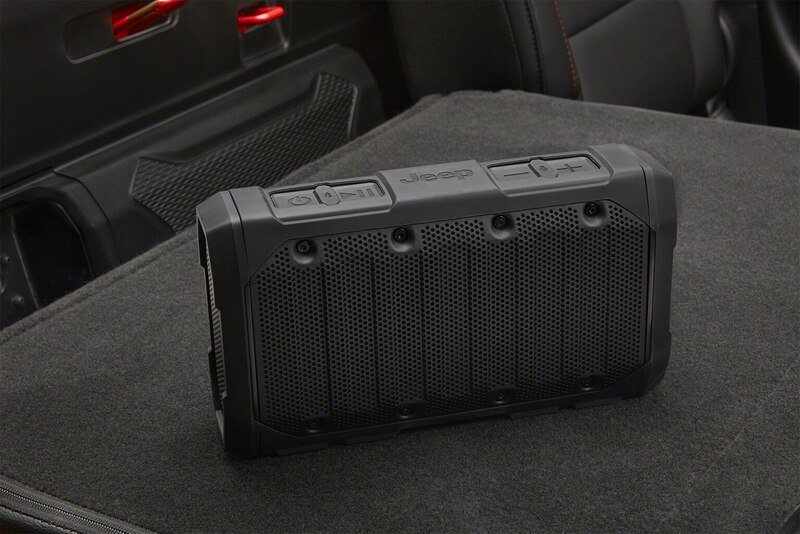 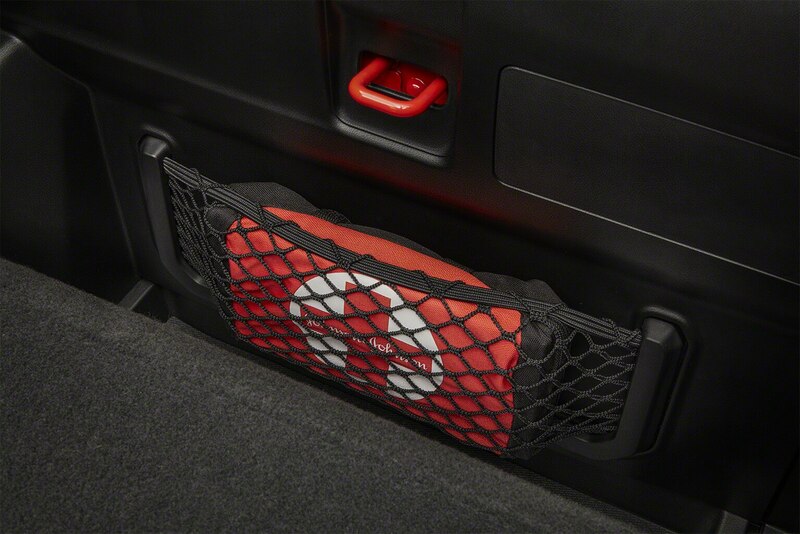 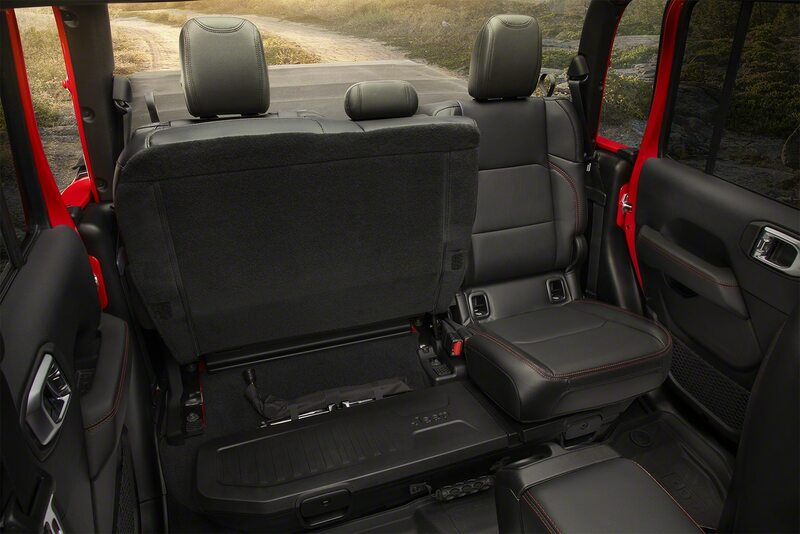 The rear-seat bottom cushion can flip up as in most other pickups, and it sports removable locking storage bins under the cushion. 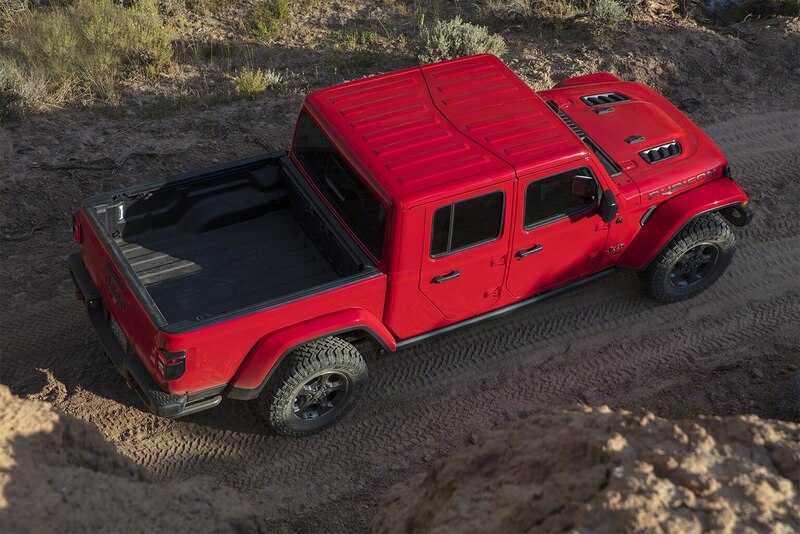 As seen in many current pickups, the Gladiator will have a three-piece rear window with a power-operated middle pane that will slide to the driver’s side. 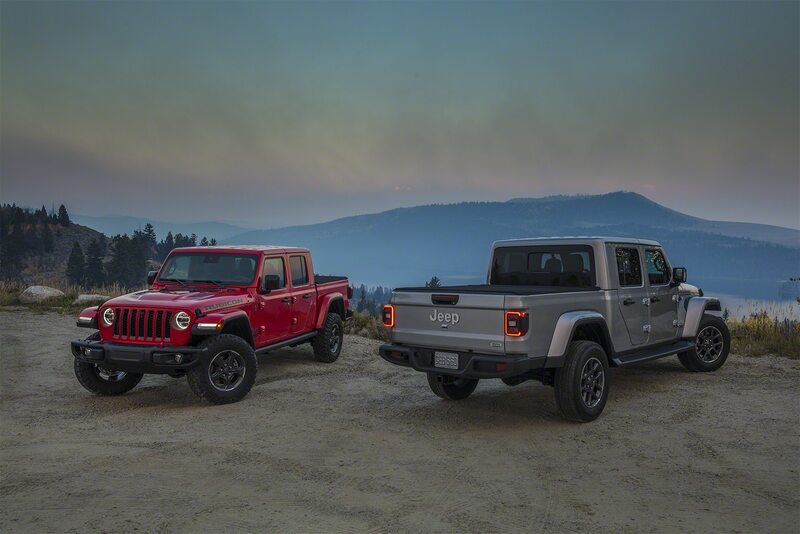 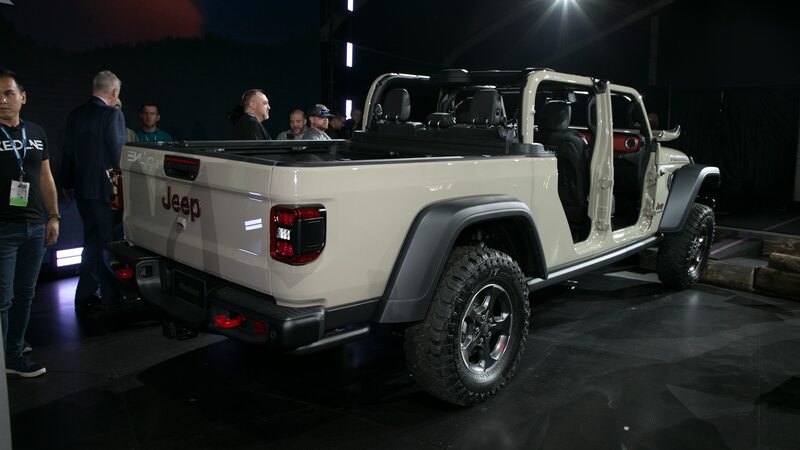 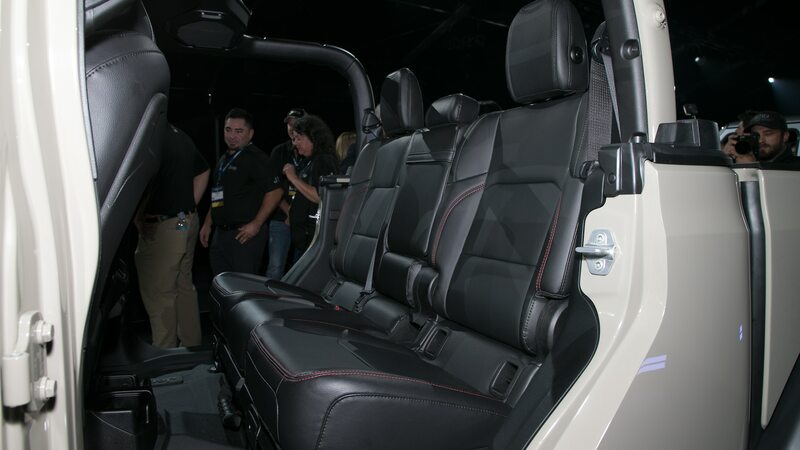 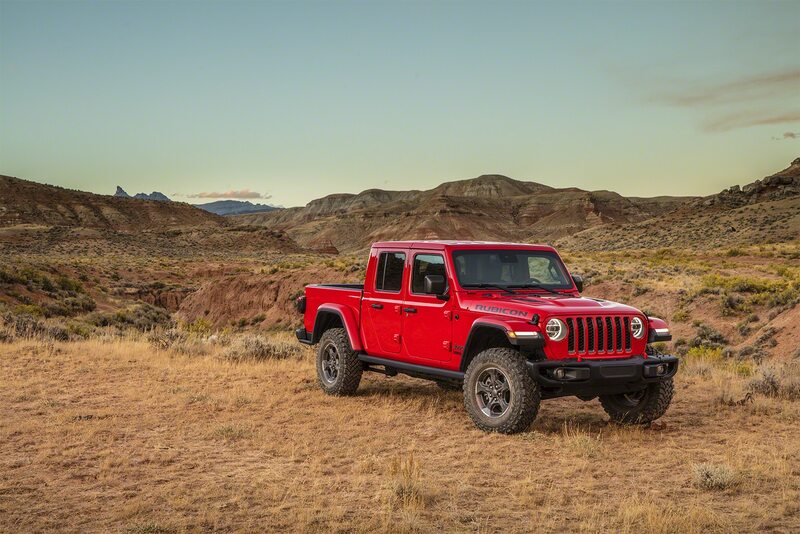 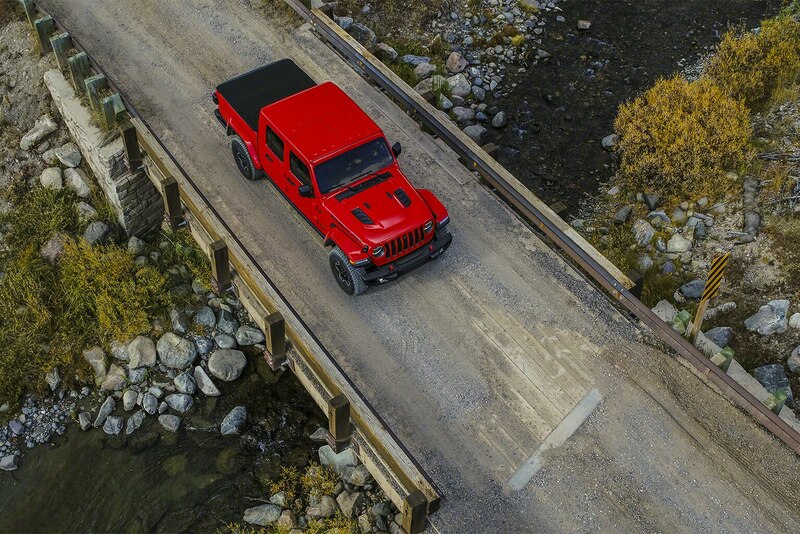 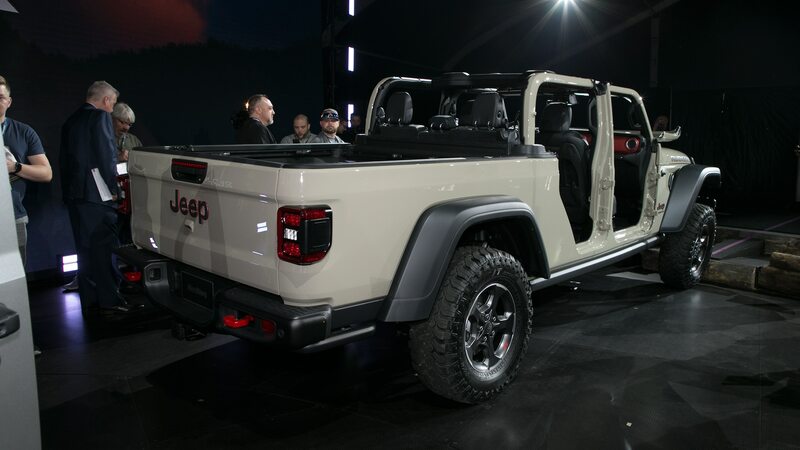 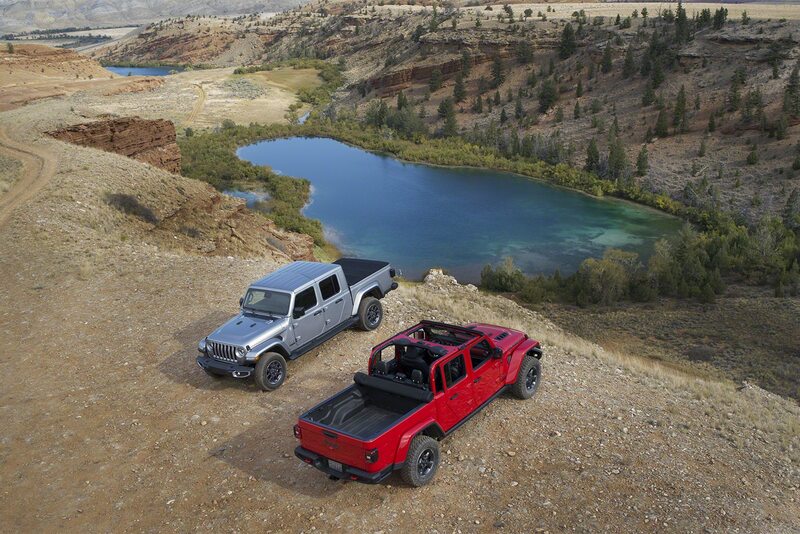 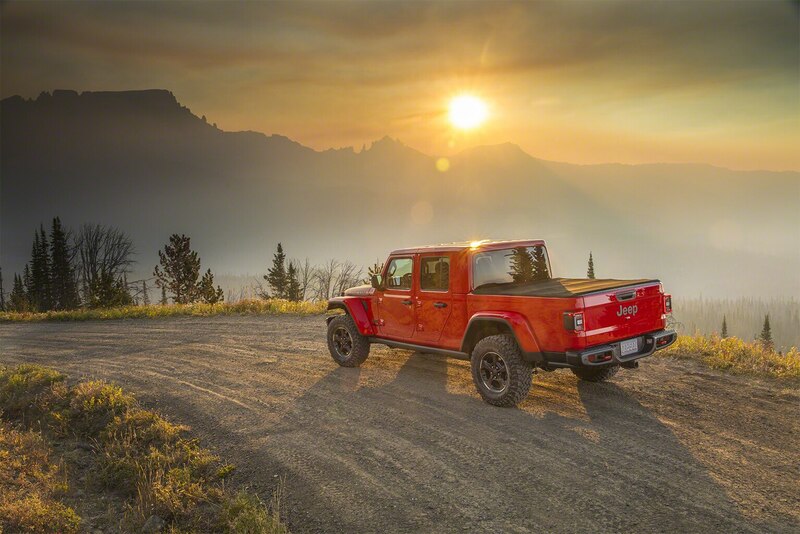 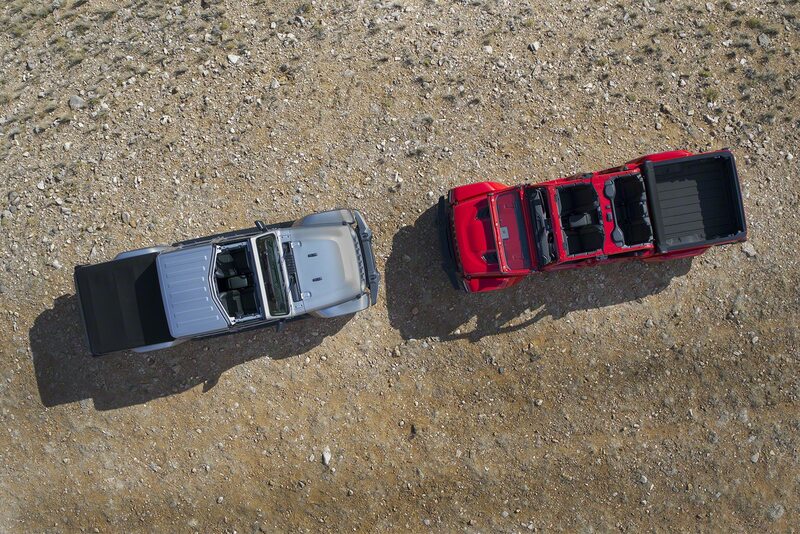 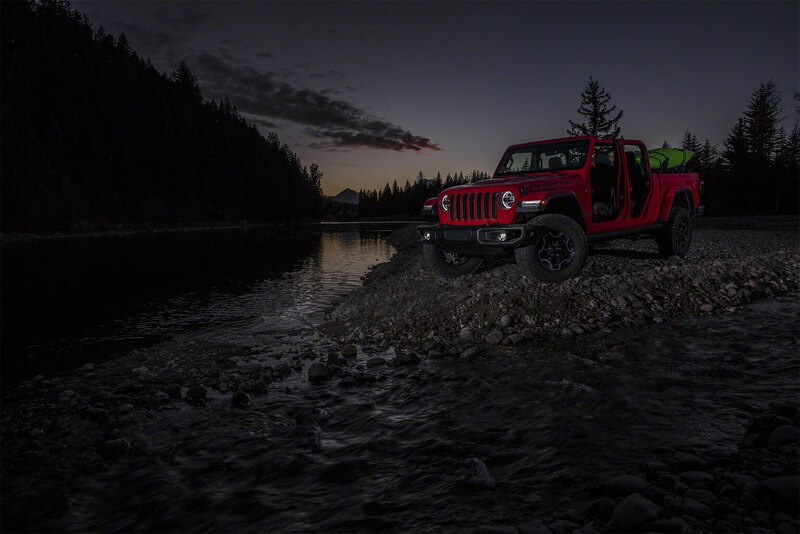 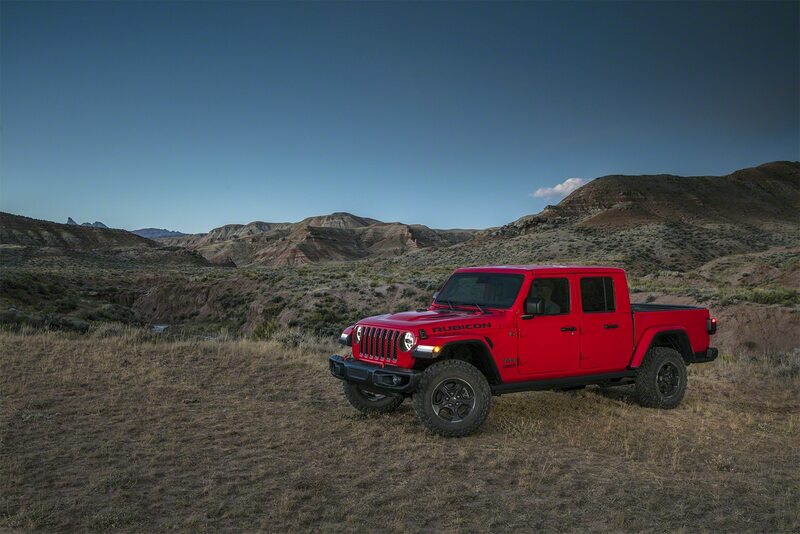 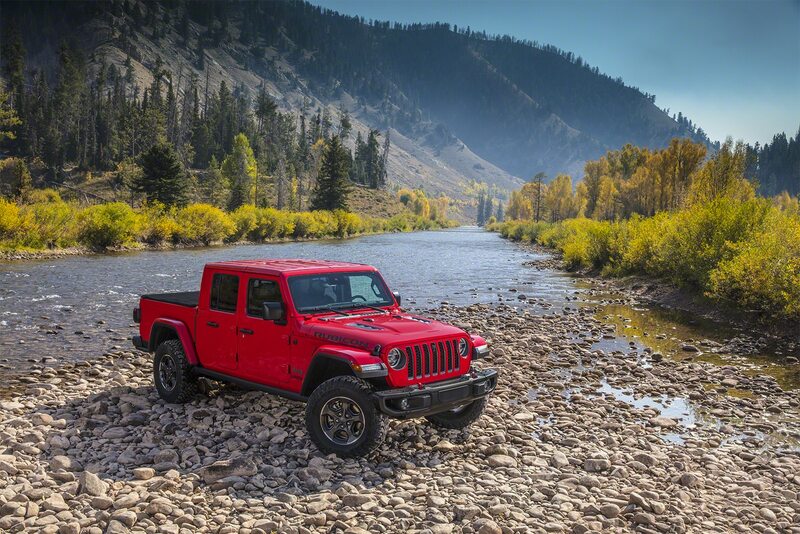 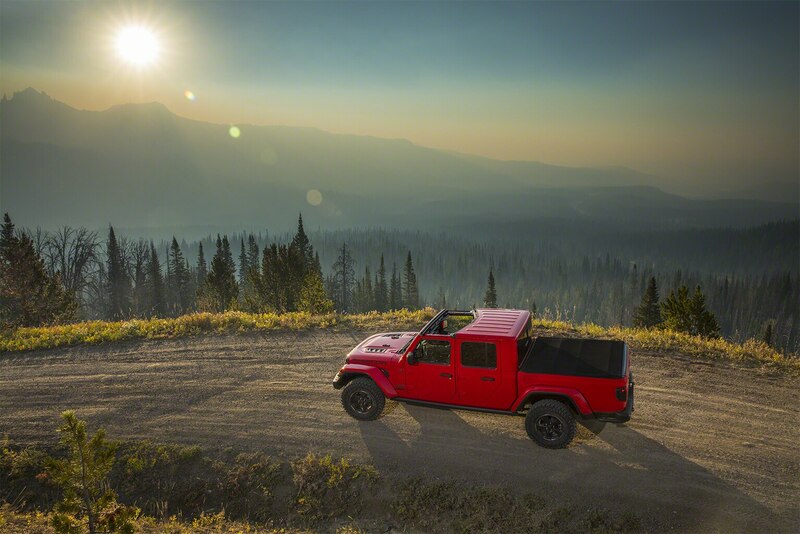 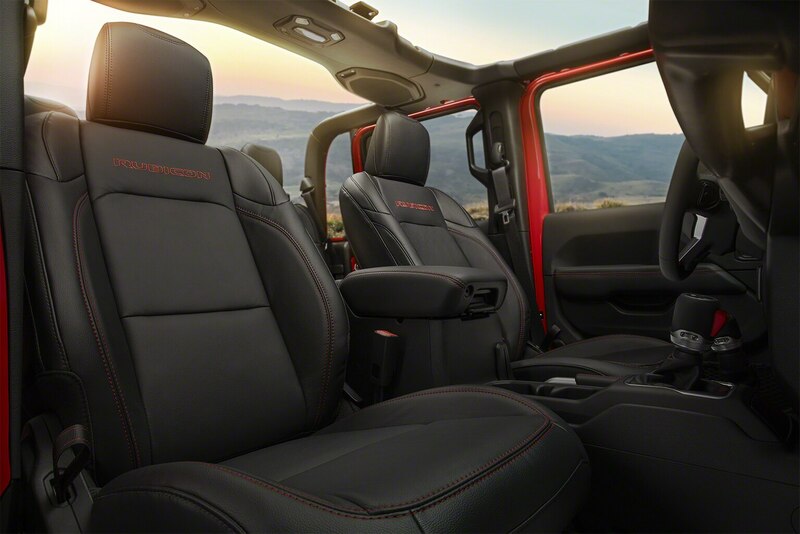 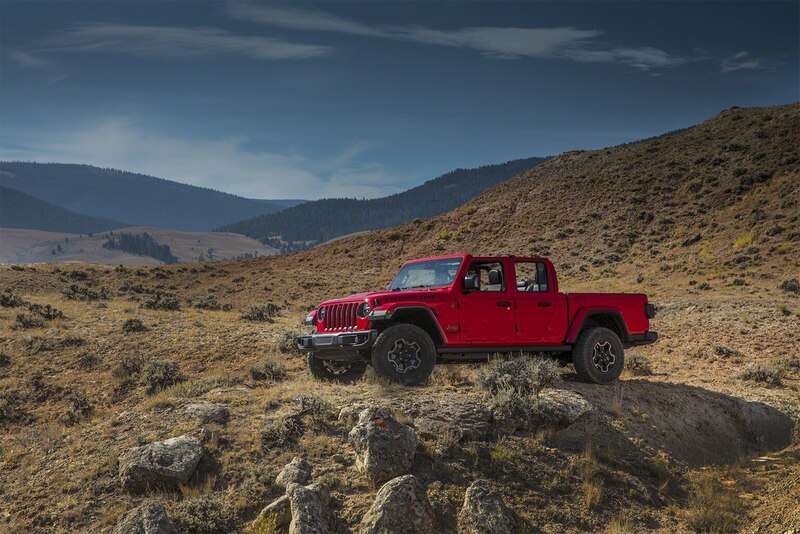 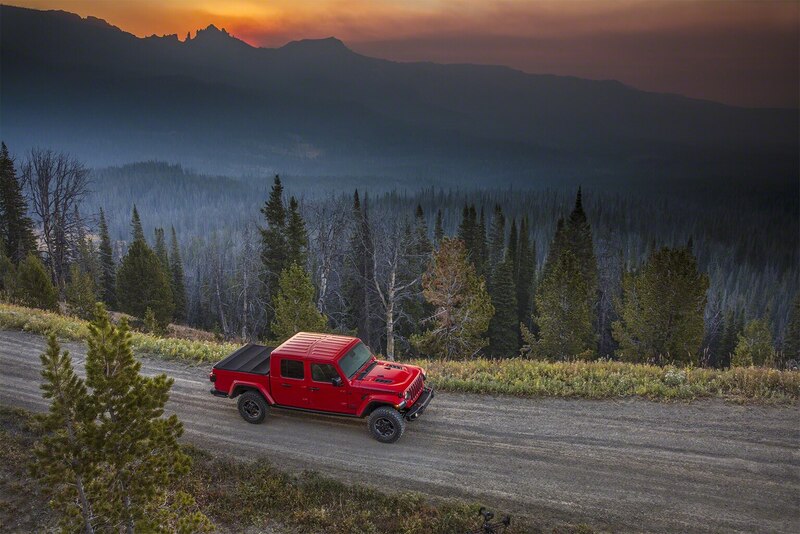 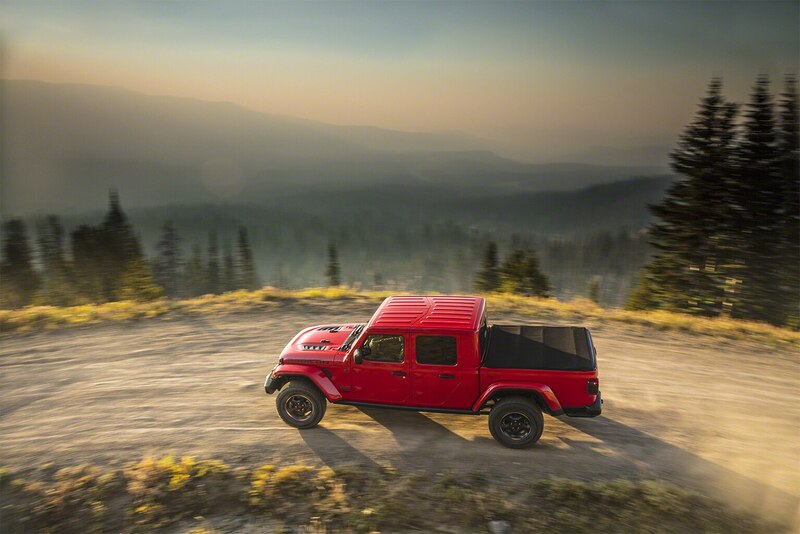 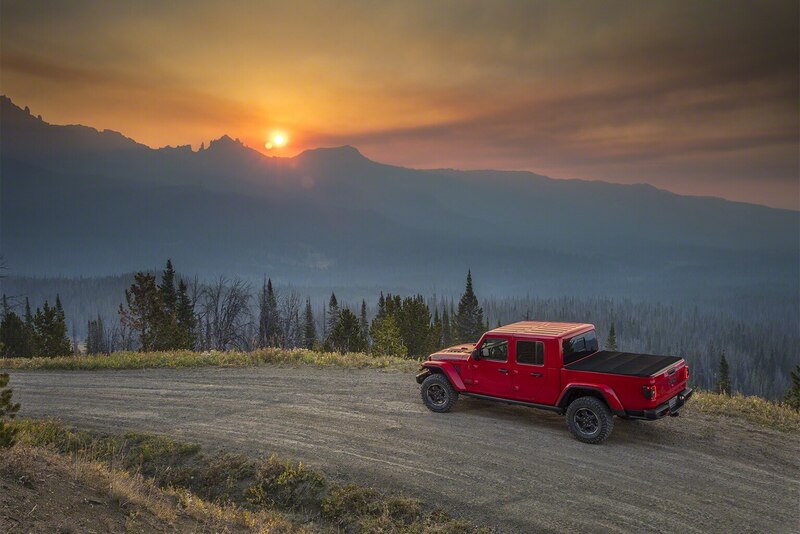 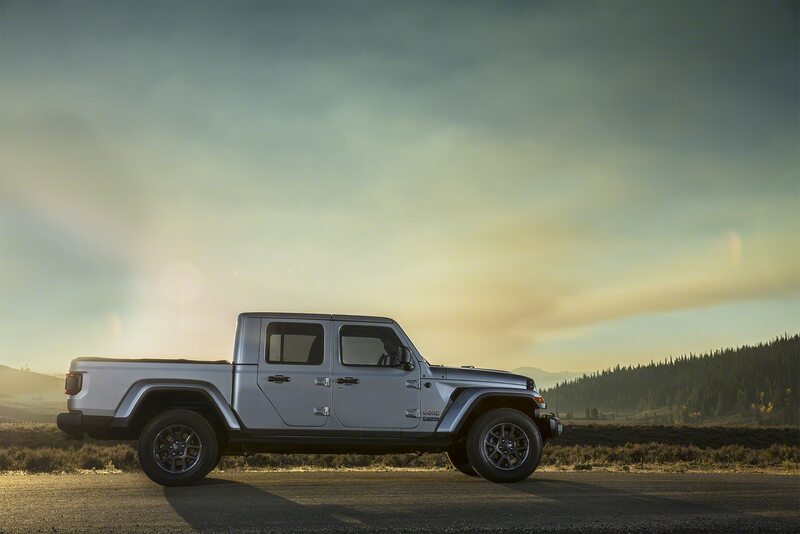 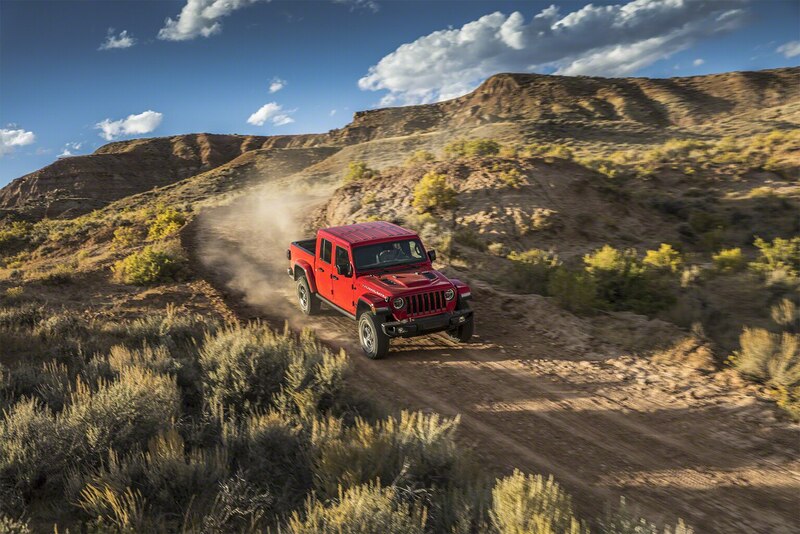 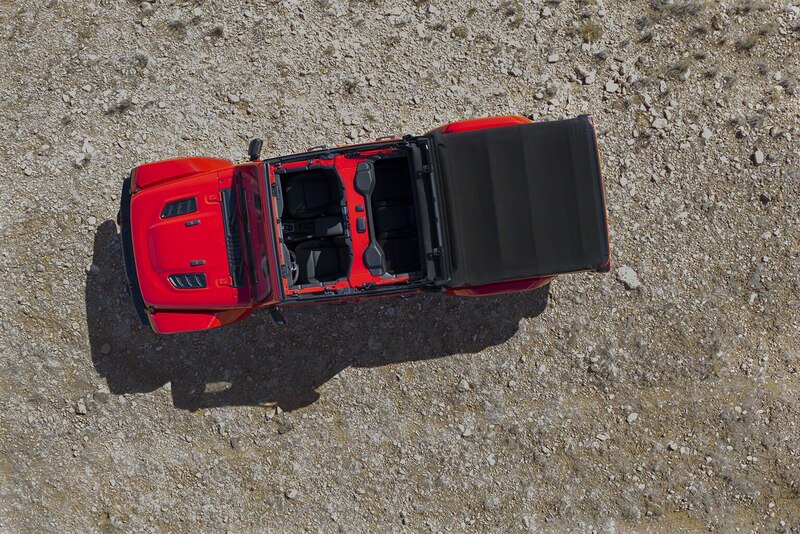 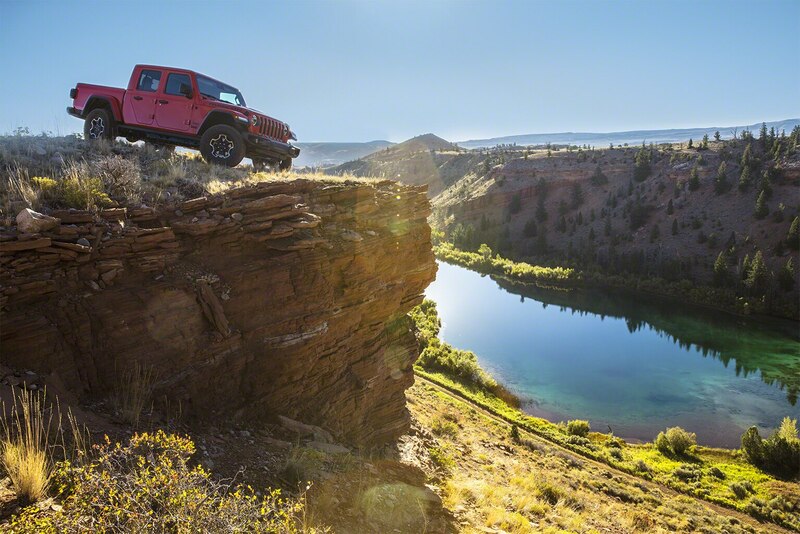 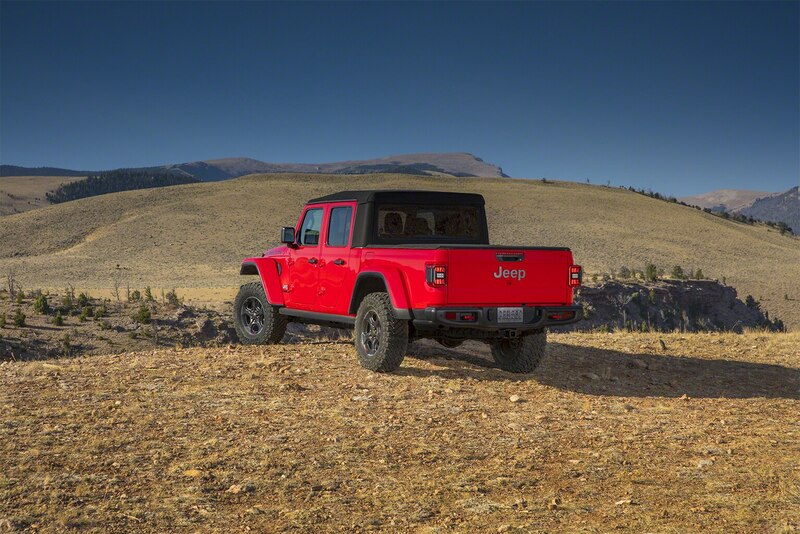 The Jeep Gladiator will be available with either of the Wrangler Unlimited’s two roof options. 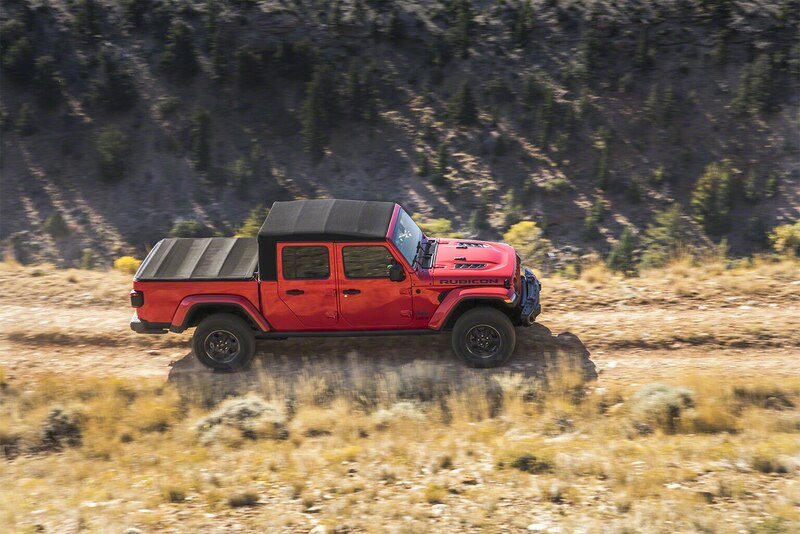 The body-color hardtop features removable “Freedom Panels” over the front seats, while the cloth soft top can open all the way, four-door-convertible style. 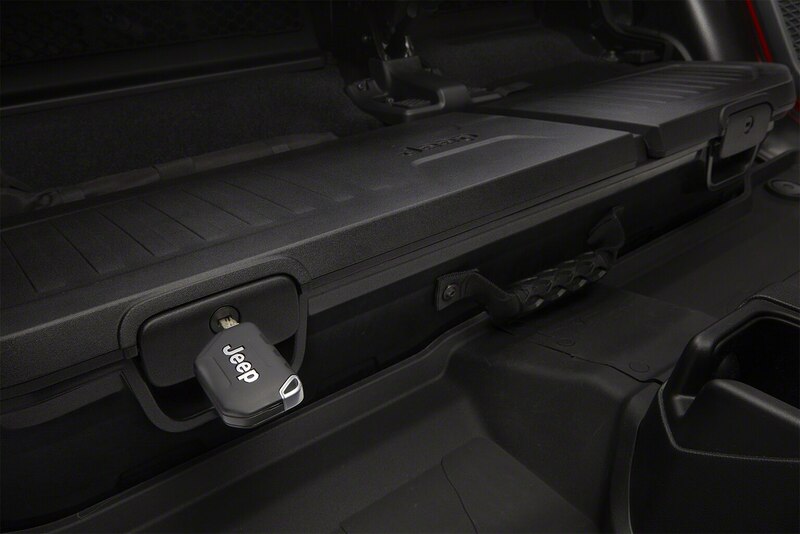 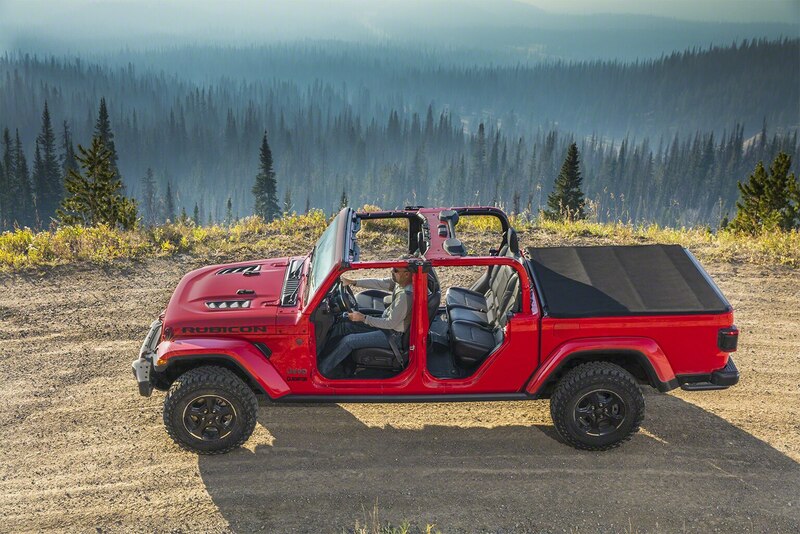 In the case of either top, the Gladiator’s doors can be removed with a hand tool, and the windshield can be folded down. 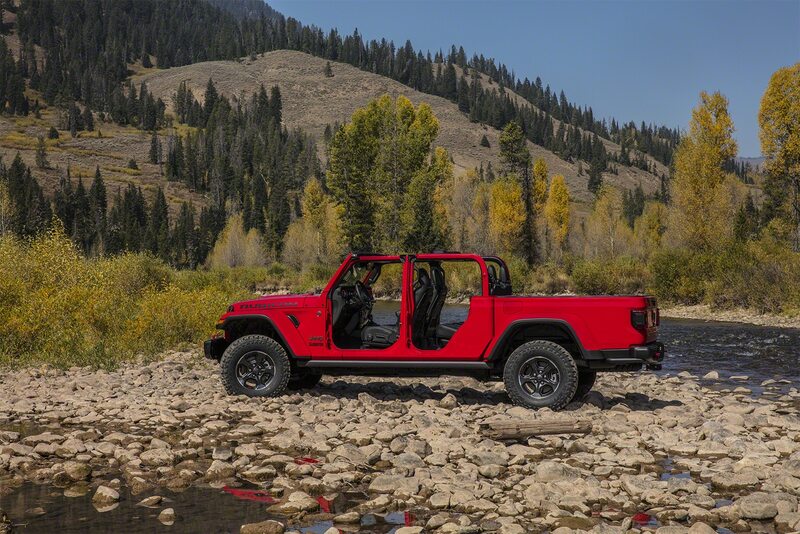 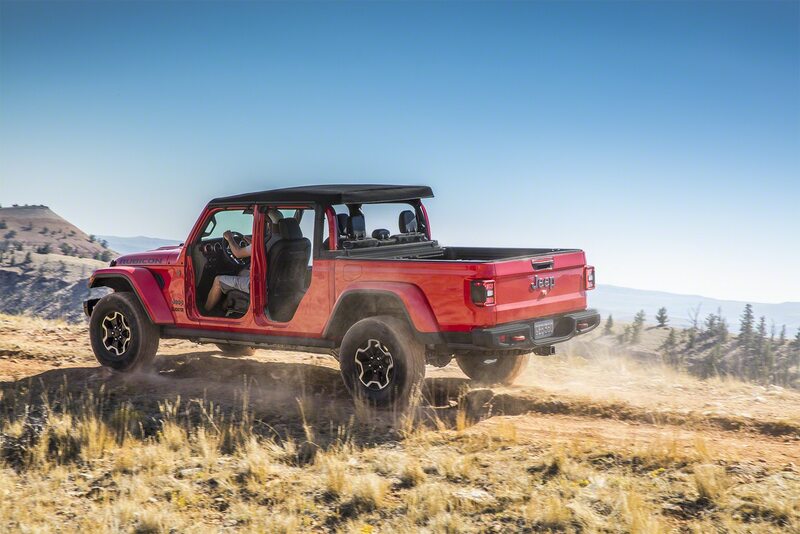 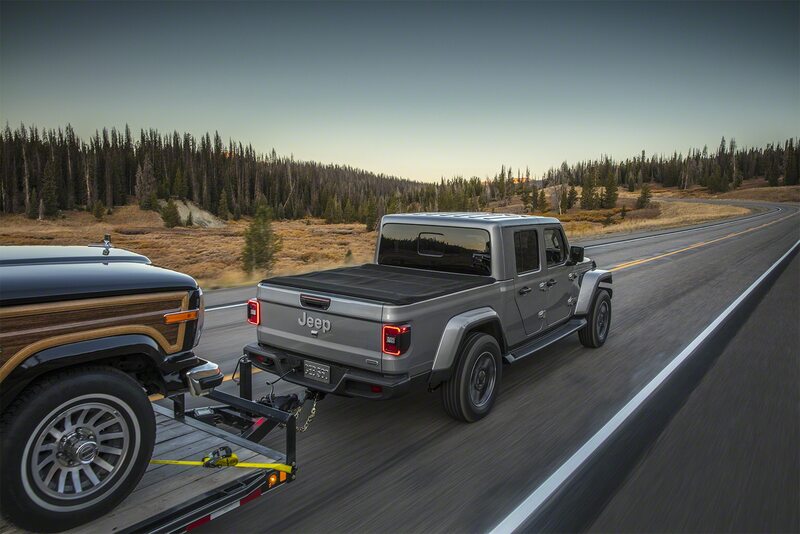 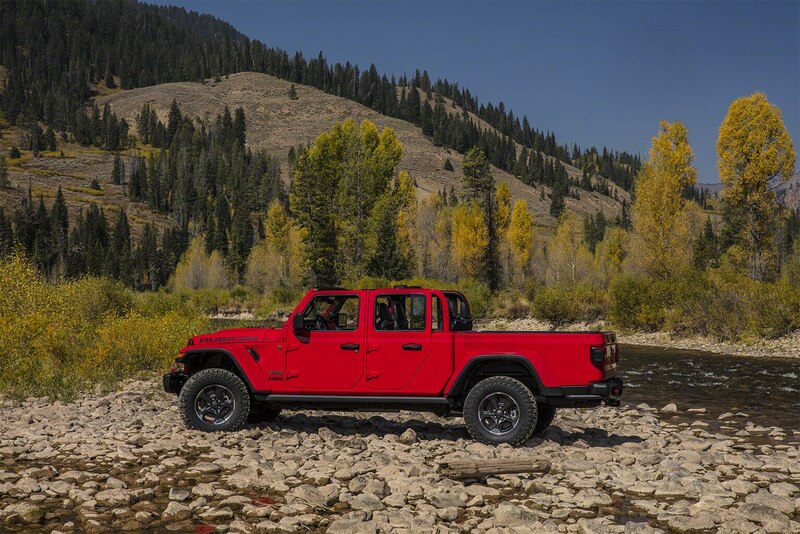 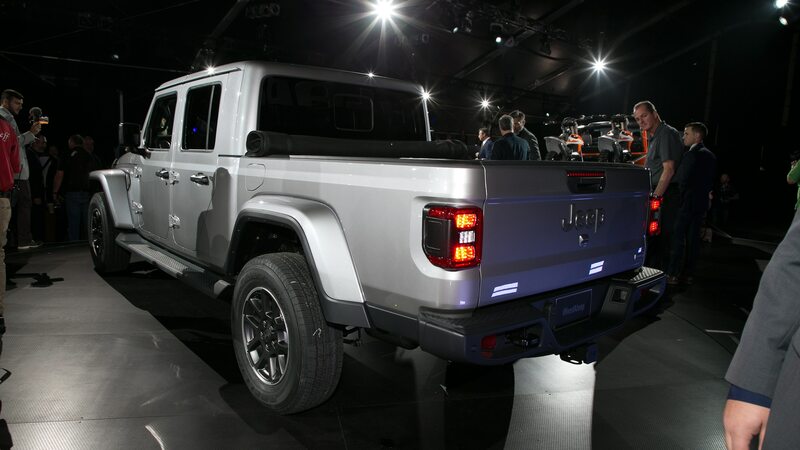 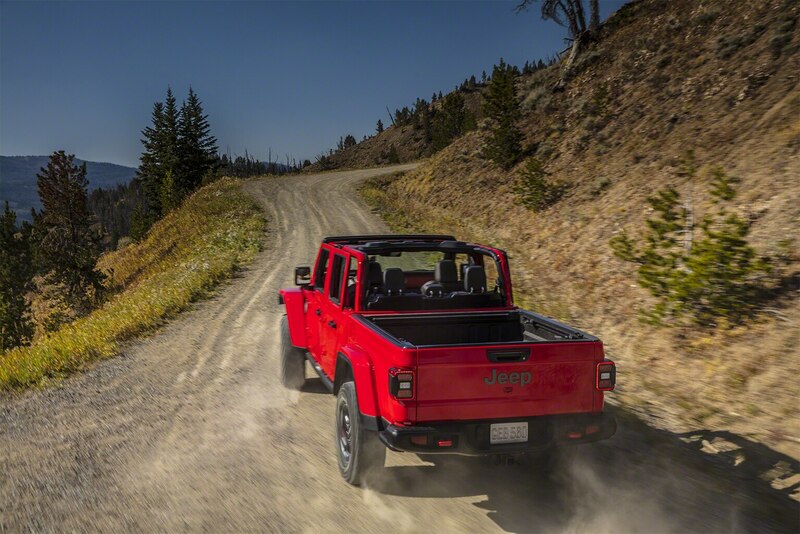 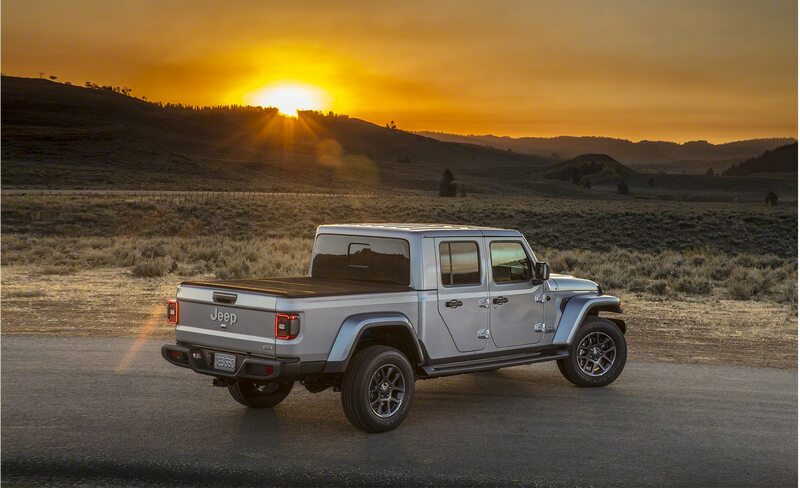 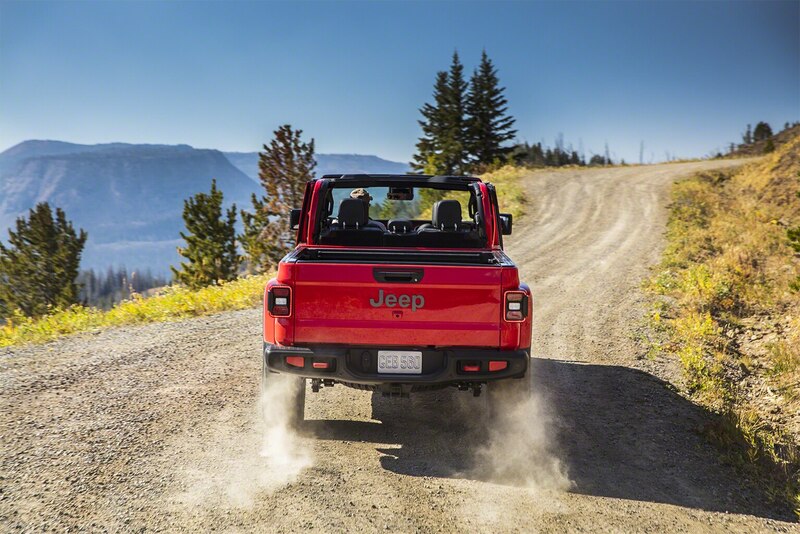 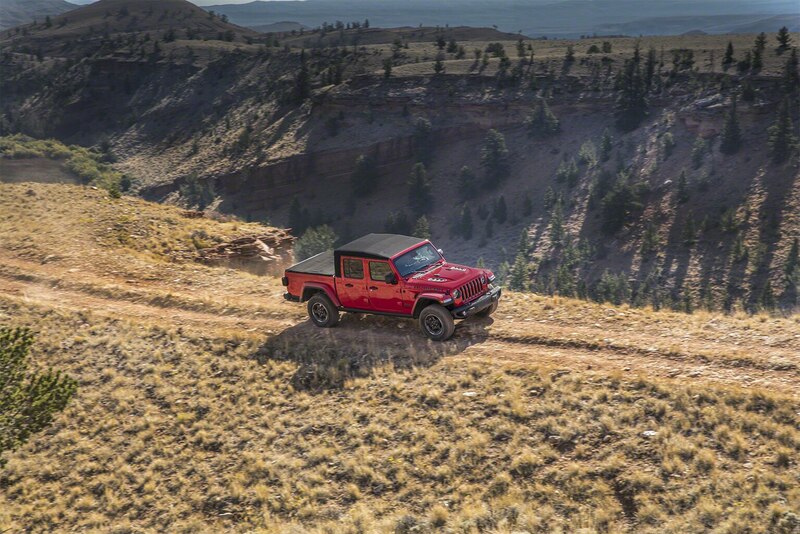 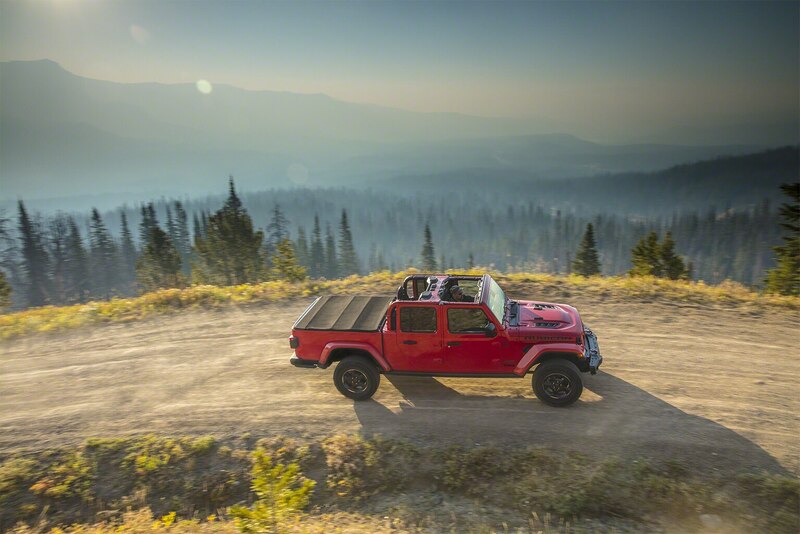 With the soft-top option, the Jeep Gladiator becomes the first factory convertible pickup truck we can remember since the Dodge Dakota ragtop of the ’80s. 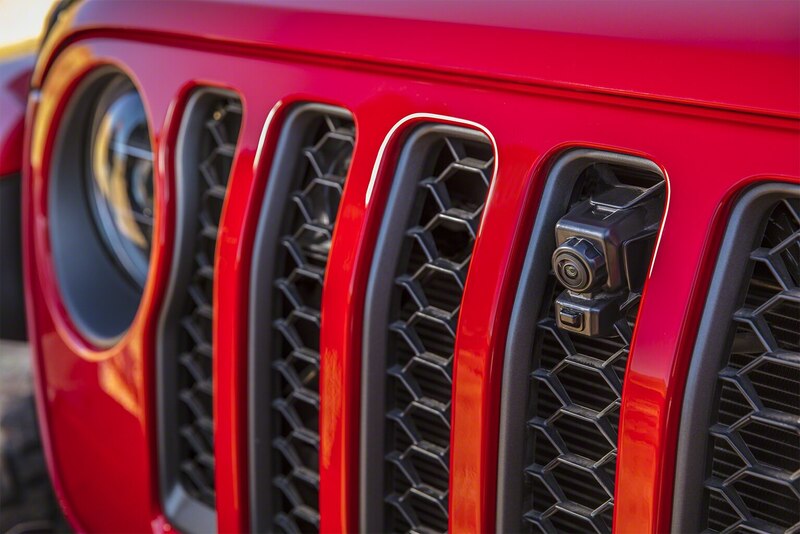 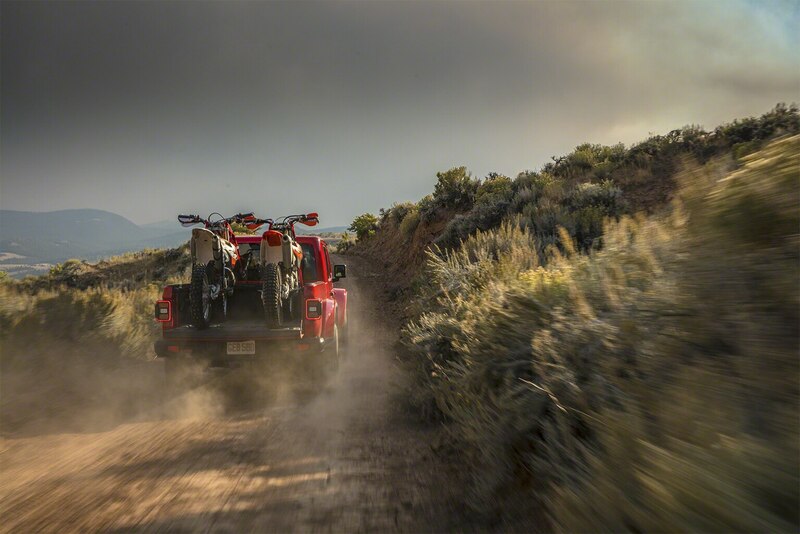 Elsewhere, the mesh of the Gladiator’s seven-slot grille is slightly larger to deliver more cooling air to the engine due to the demands of pickup-truck towing and hauling. 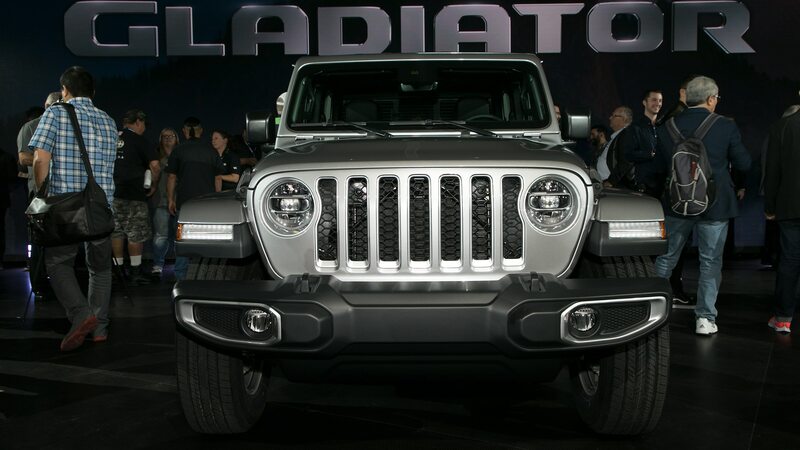 But even parked side-by-side, it’s hard to distinguish the Gladiator’s grille from the Wrangler’s. 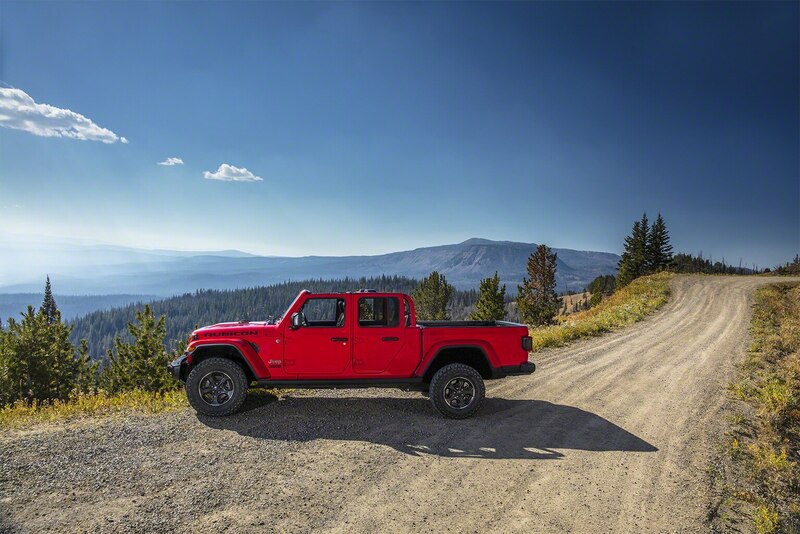 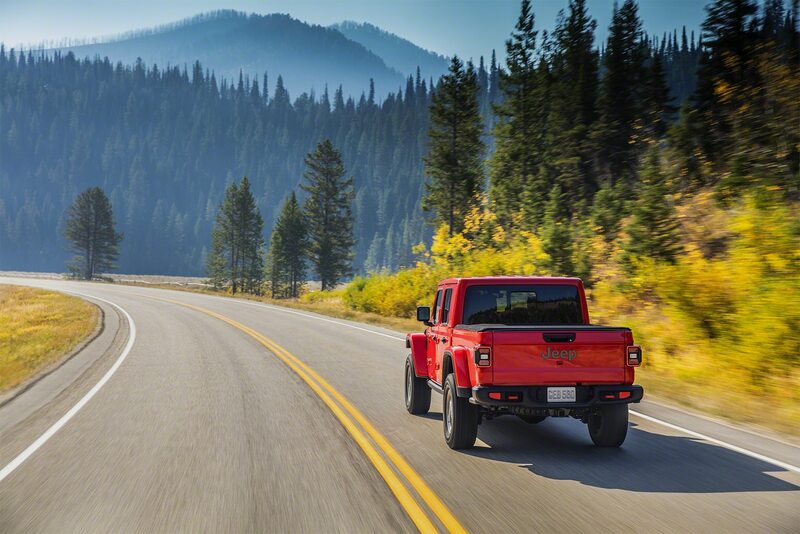 The ’20 Gladiator launches with the gas-fueled 3.6-liter Pentastar V-6, rated for 285 horsepower and 260 lb-ft and hooked up to your choice of an eight-speed automatic or—good news, purists!—a six-speed manual transmission, a rarity these days even among mid-size pickups. 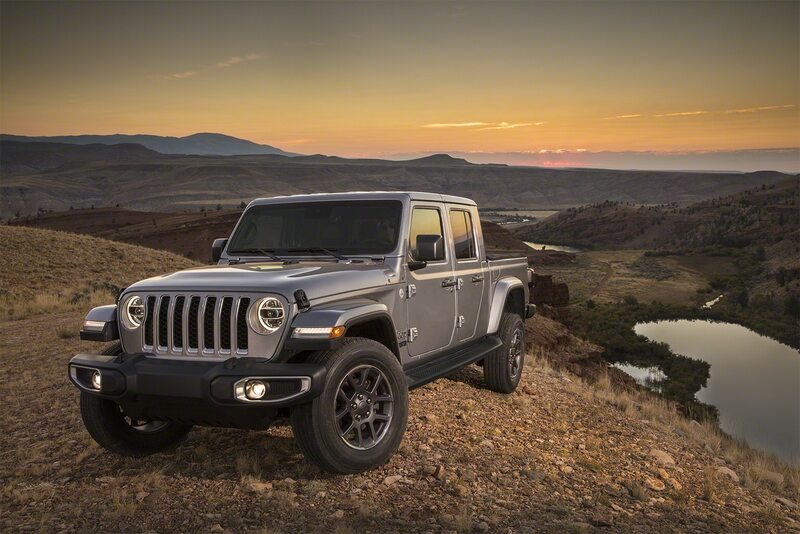 In the 2020 calendar year, Jeep will add its 3.0-liter diesel V-6, and it will deliver 260 horses and 442 lb-ft. 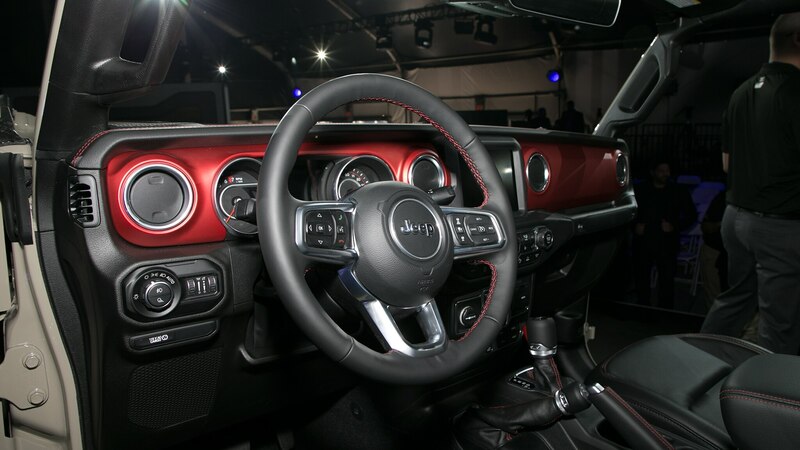 It will be available only with a six-speed automatic. 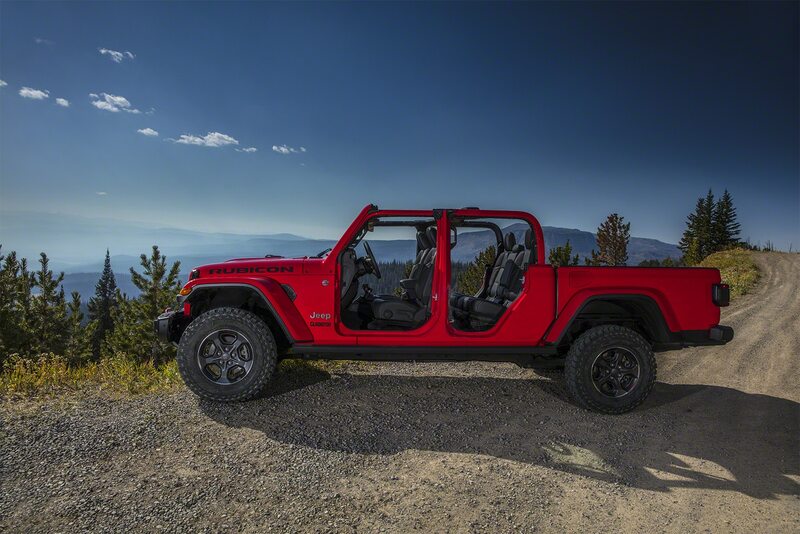 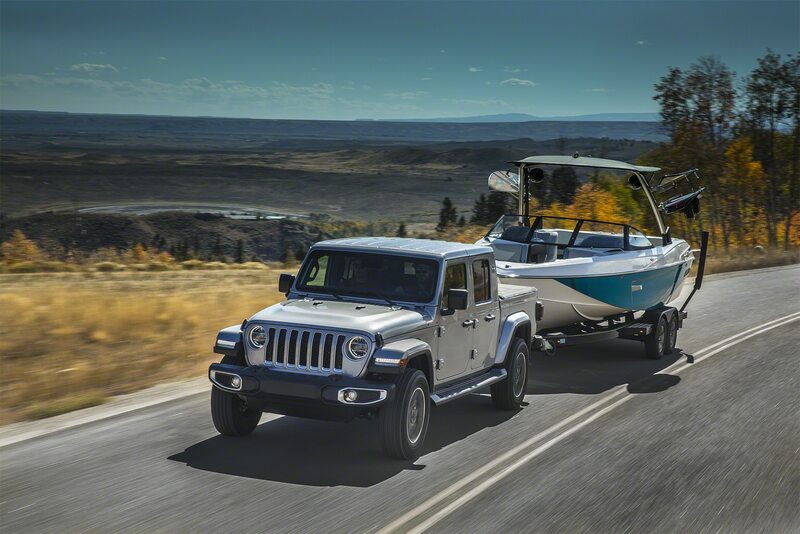 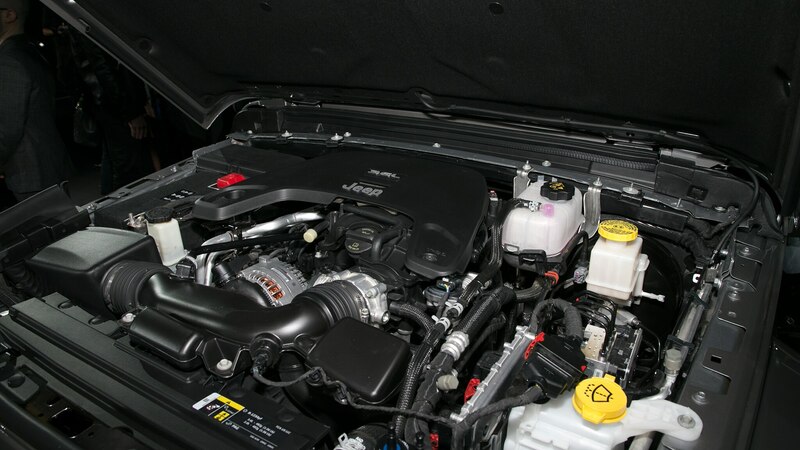 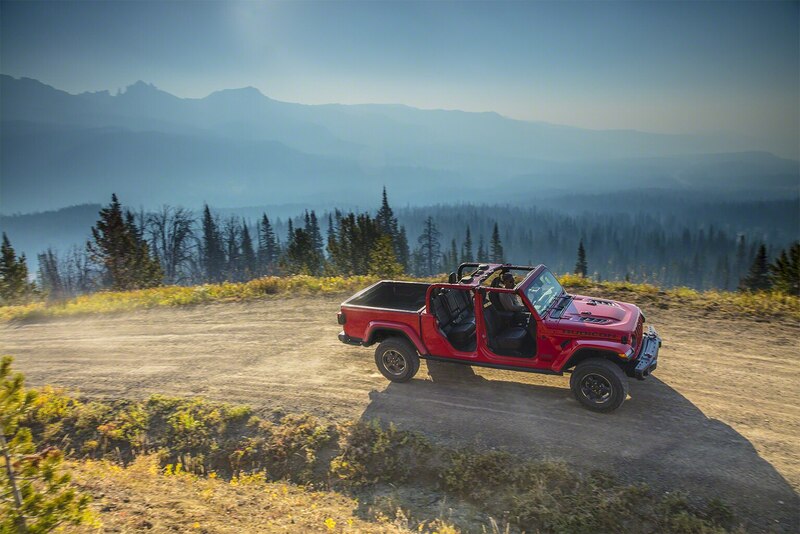 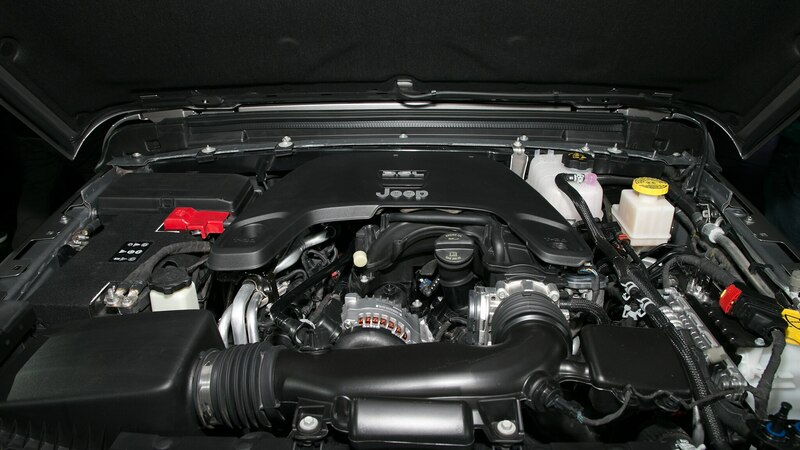 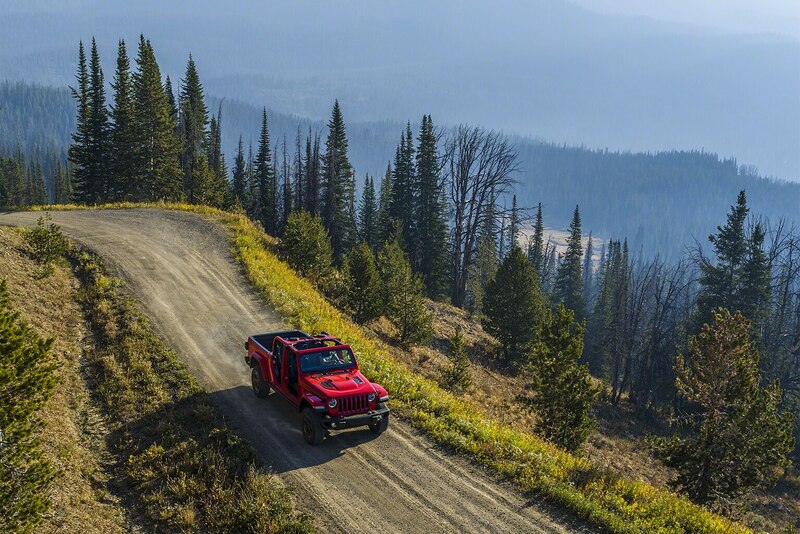 Jeep has no plans to add the 48-volt, 2.0-liter turbocharged four-cylinder gas engine from the Wrangler lineup to the Gladiator’s. 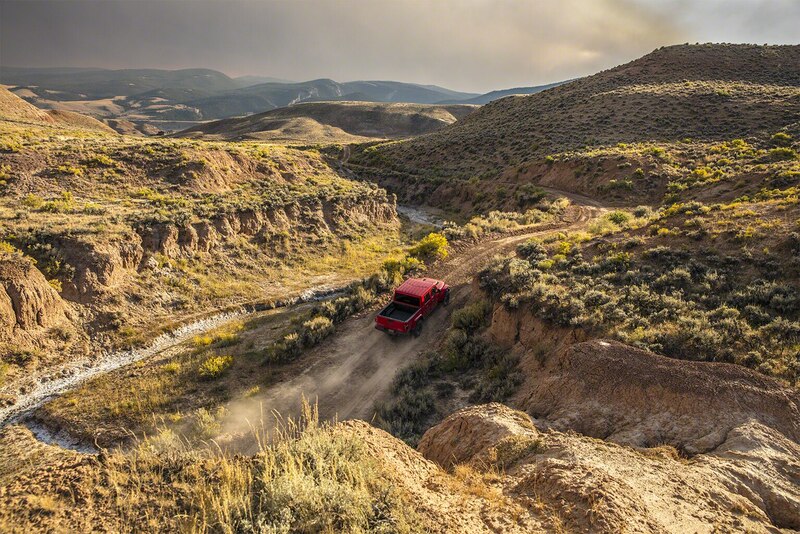 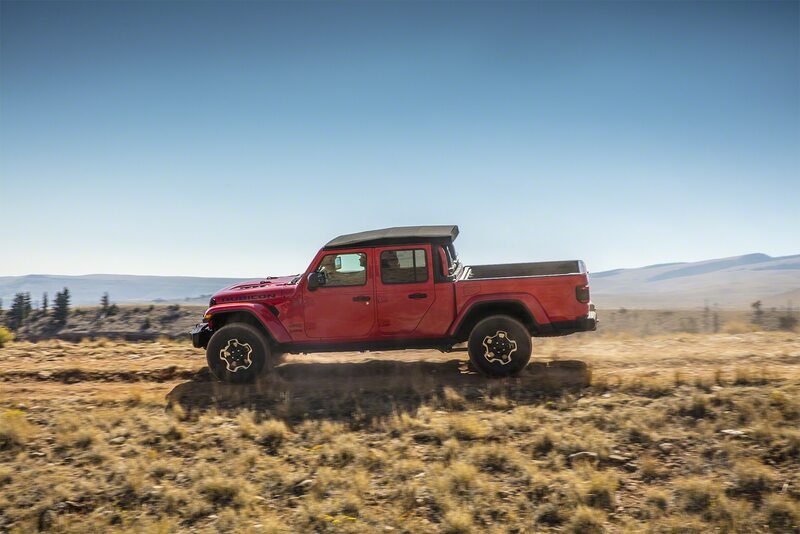 Perhaps even bigger news in the powertrain department is the addition of an Off-Road Plus setting for the driver-adjustable four-wheel-drive system. 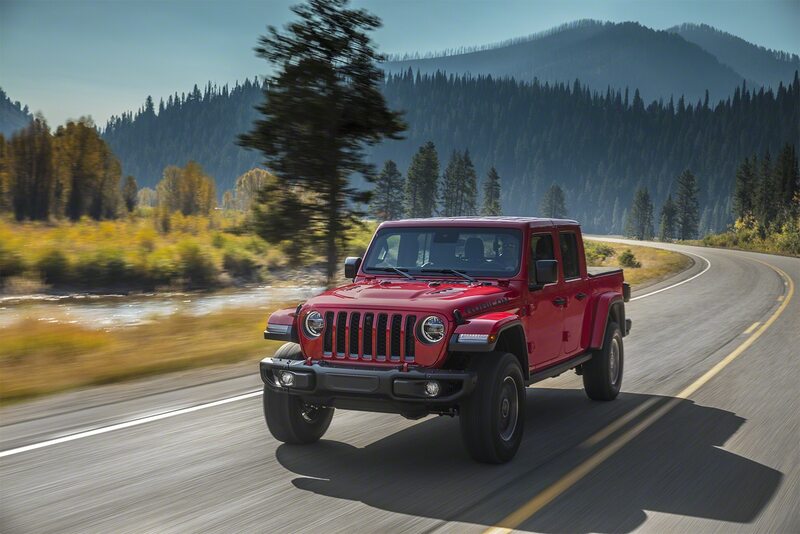 This allows higher vehicle speeds with the rear locker engaged, Allen says, and you can bet this feature will migrate to the Wrangler lineup, likely by the ’20 model year. 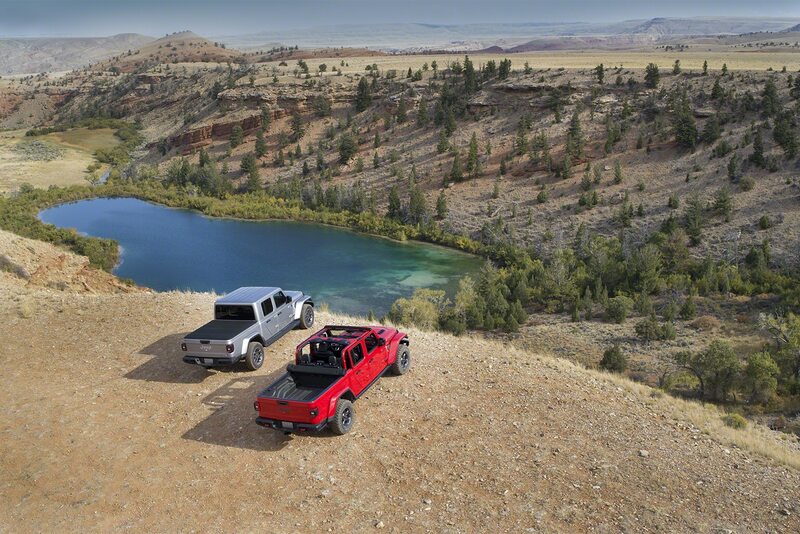 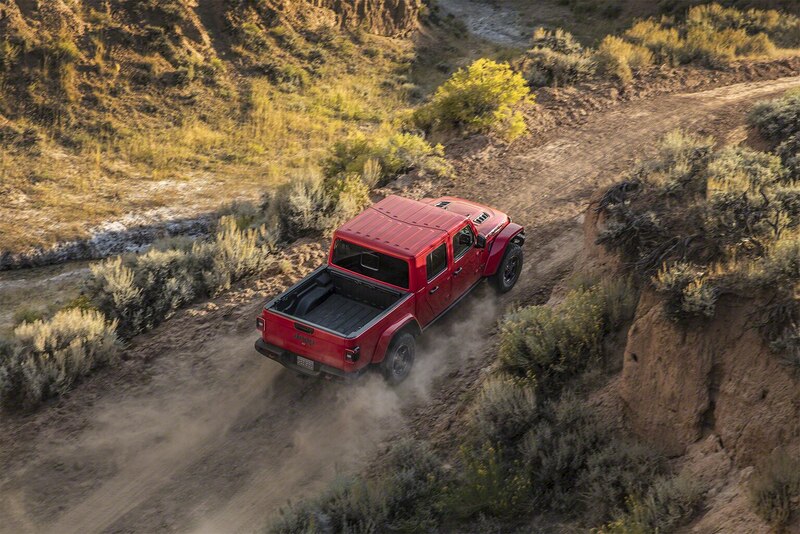 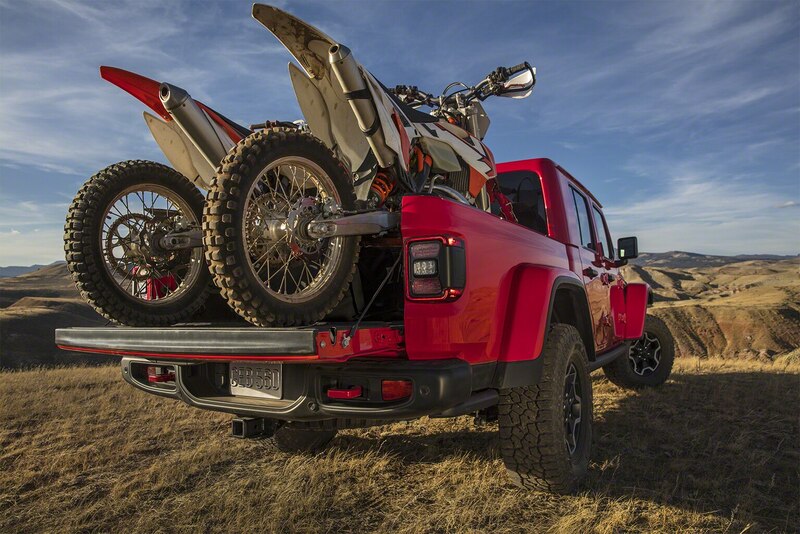 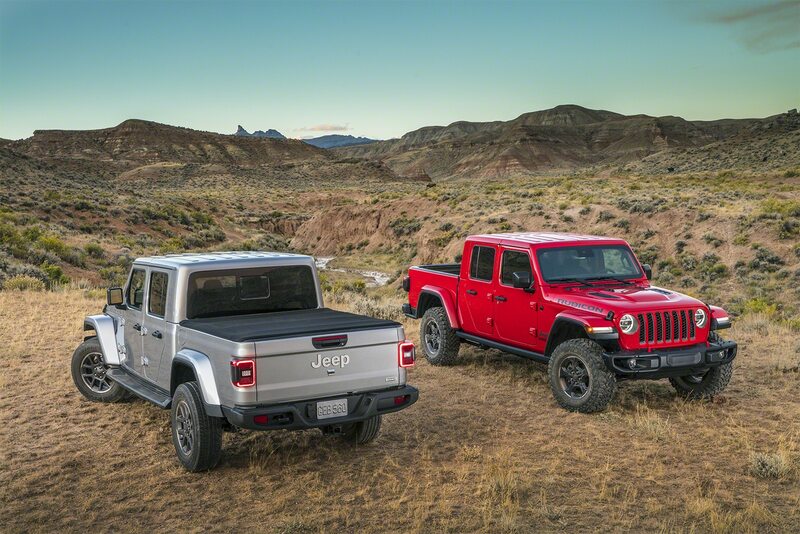 While Allen declined to comment on the possibility, Off-Road Plus already has us thinking of a future where even more high-speed capability sees Jeep battling the Ford F-150 Raptor and Chevrolet Colorado ZR2 with potential high-performance versions of the Gladiator and Wrangler. 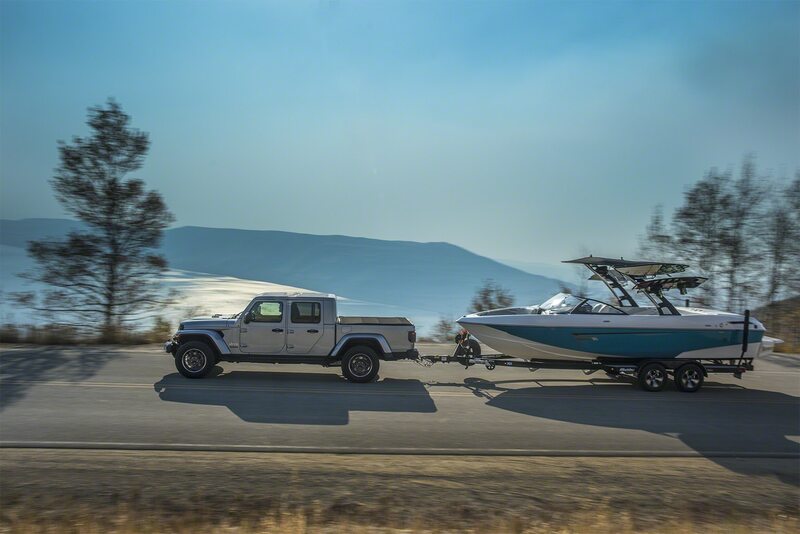 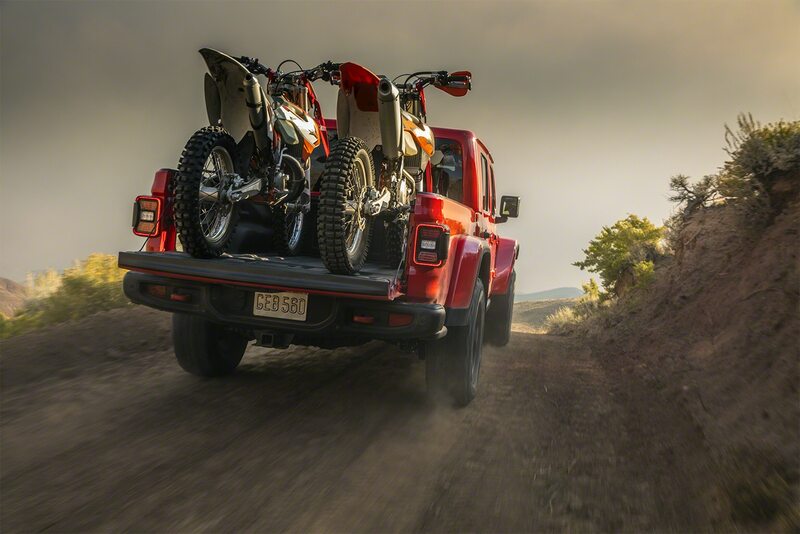 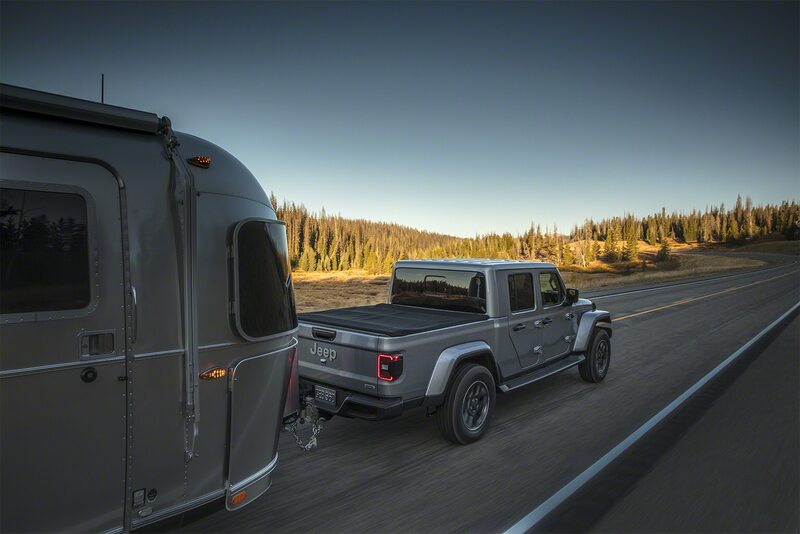 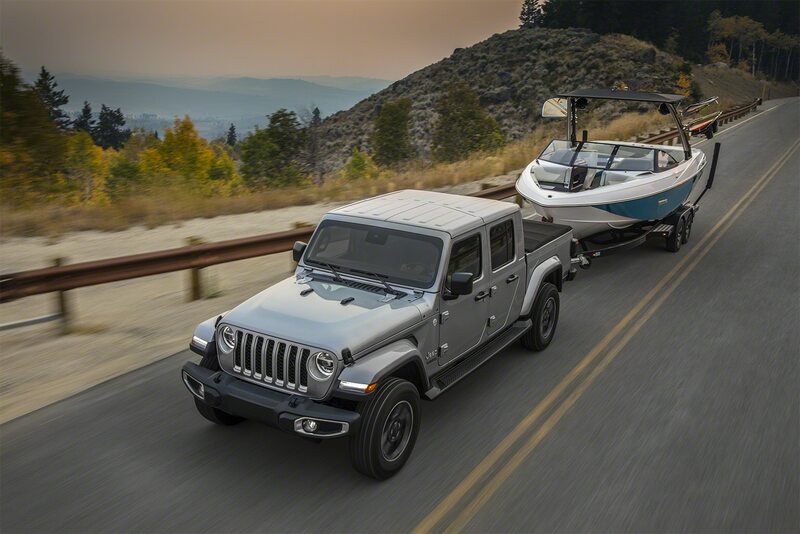 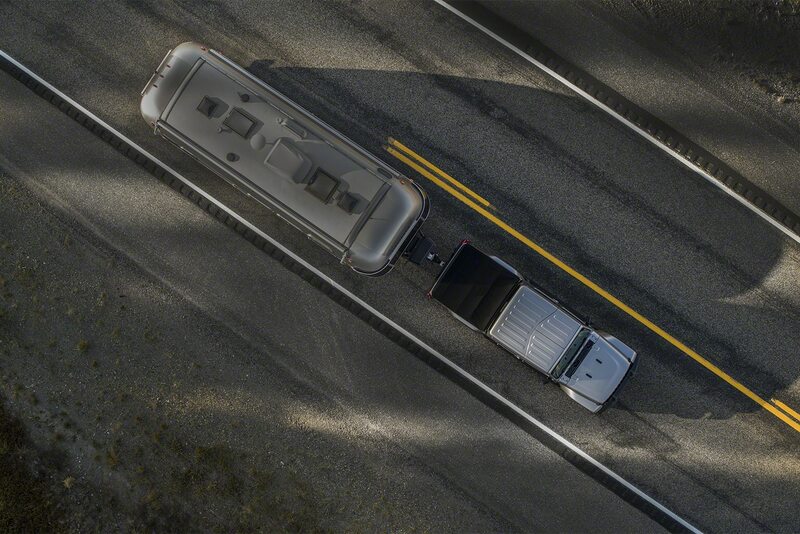 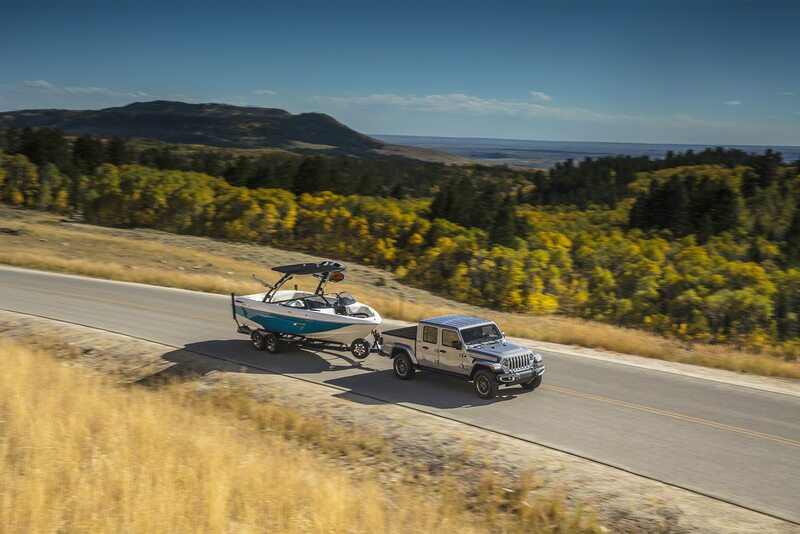 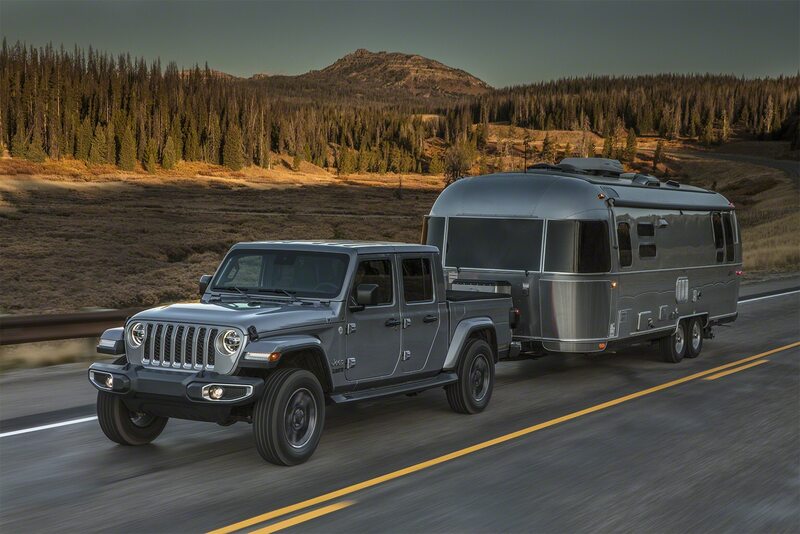 Maximum towing is 7,650 pounds for the Gladiator Sport S, some 500 higher than the max for a Wrangler Unlimited. 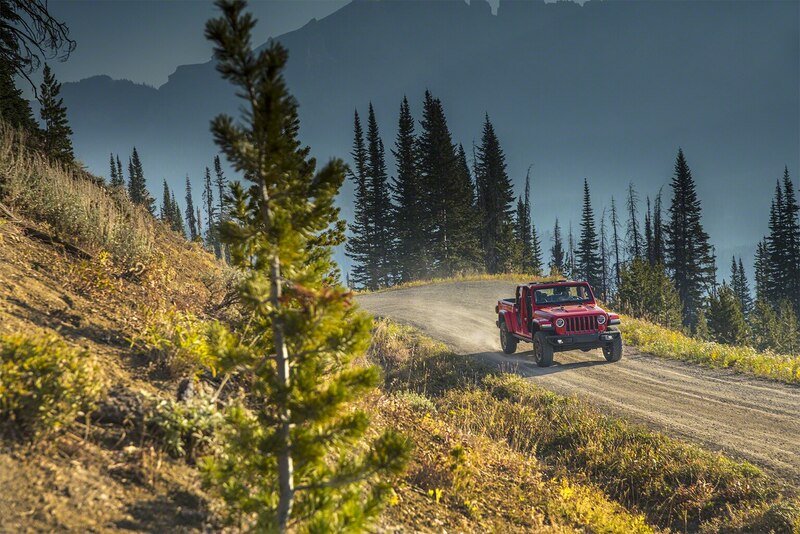 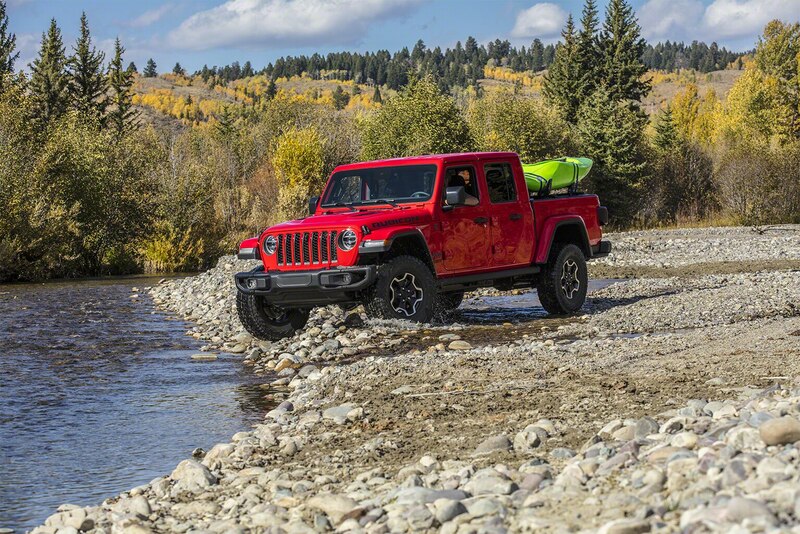 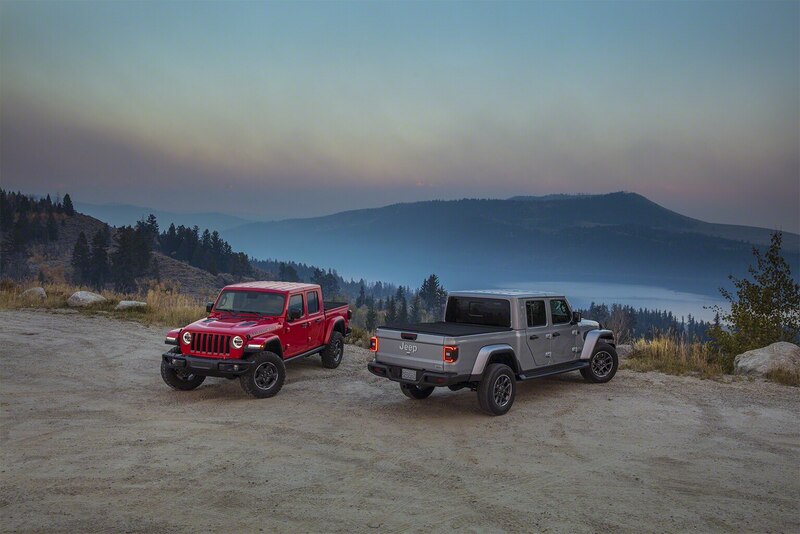 Jeep has shaken up the trim levels from what’s available in the Wrangler models. 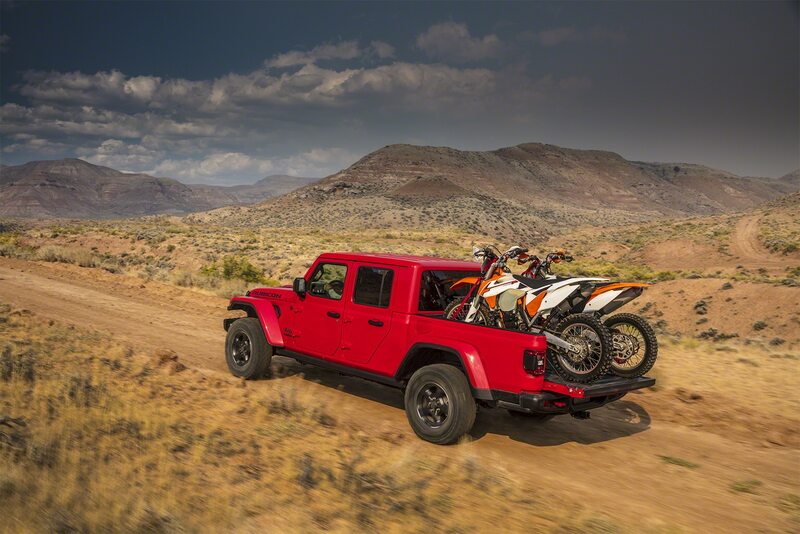 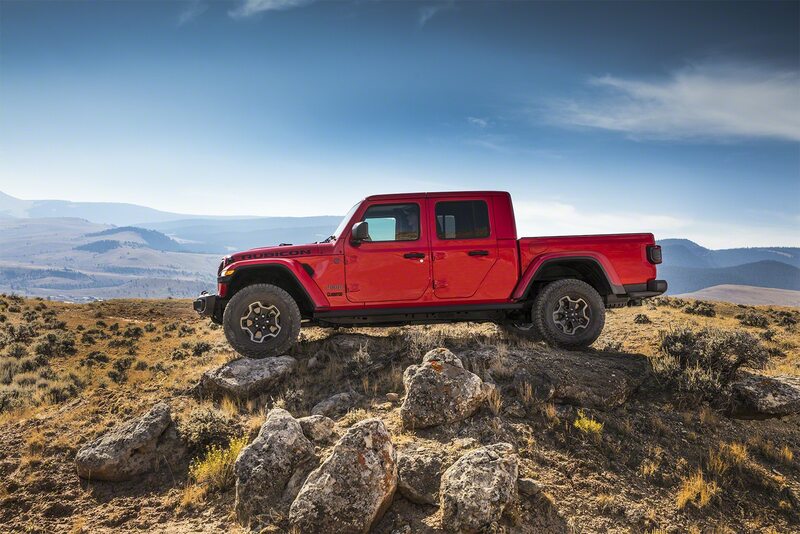 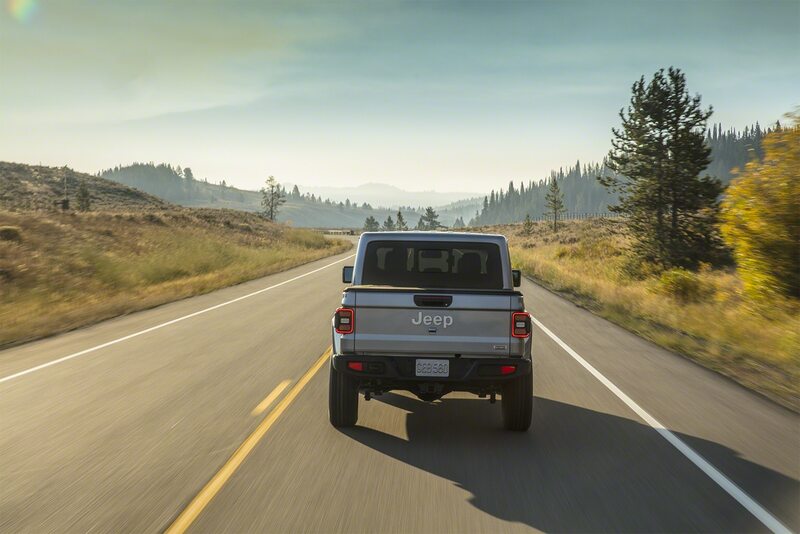 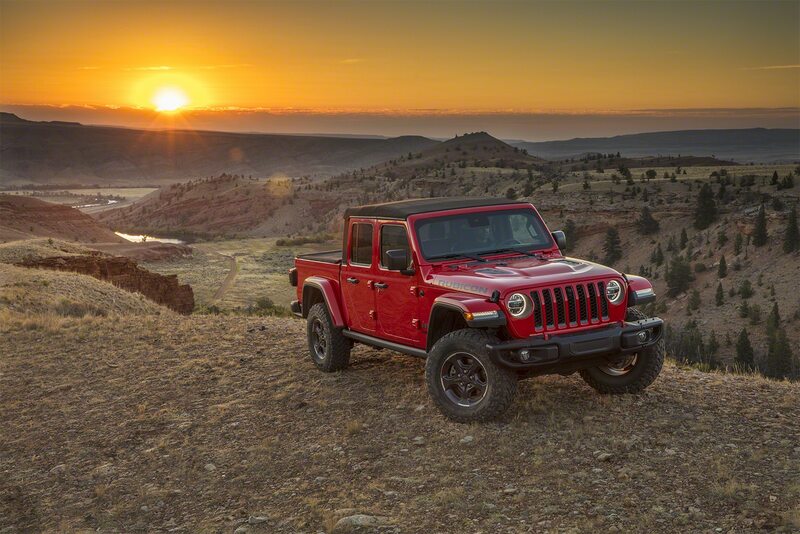 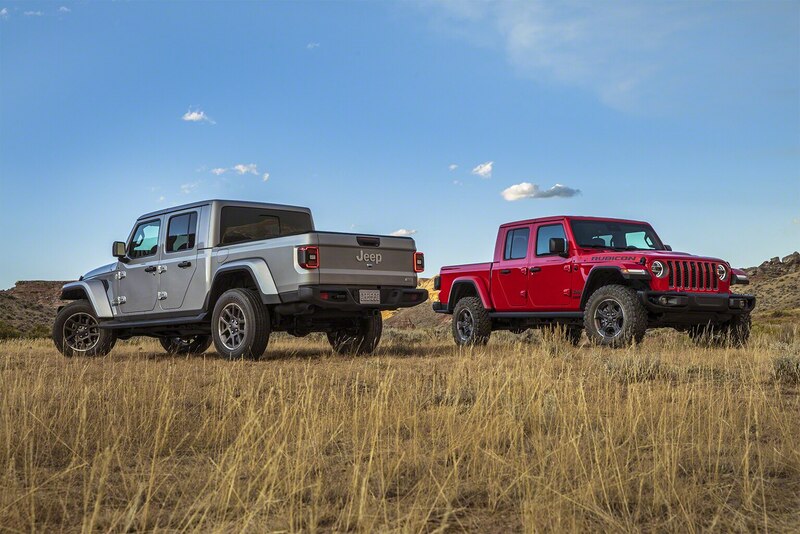 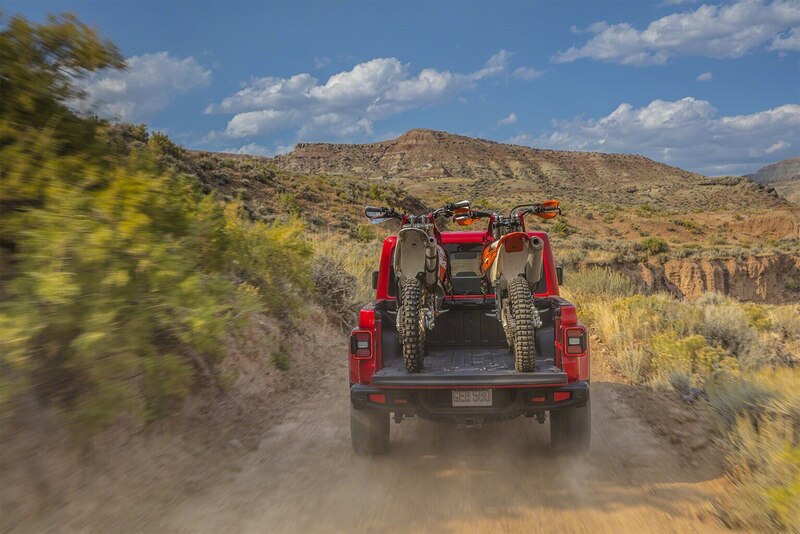 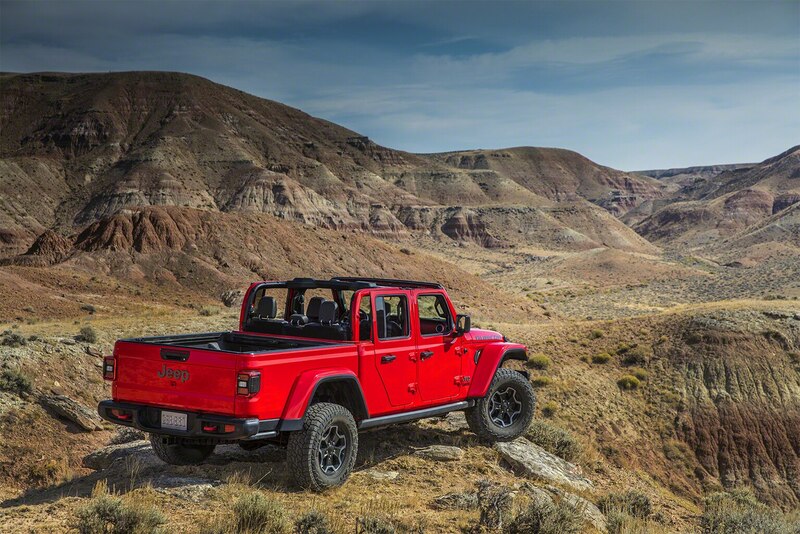 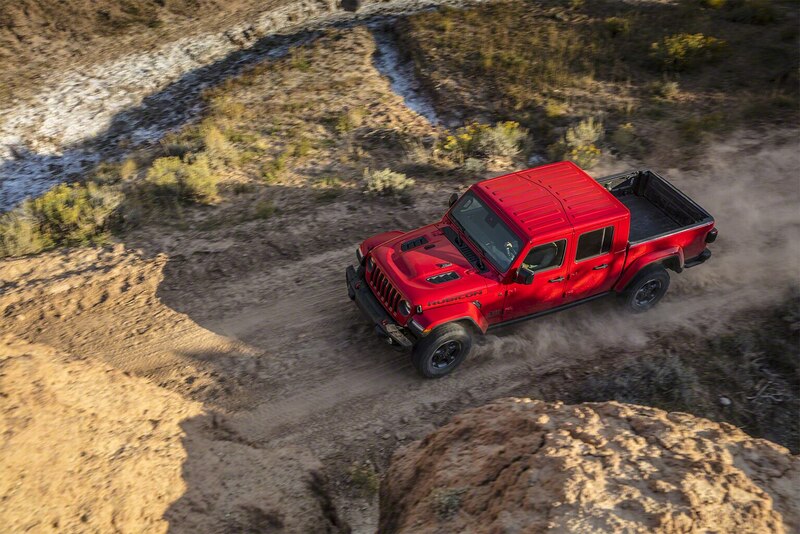 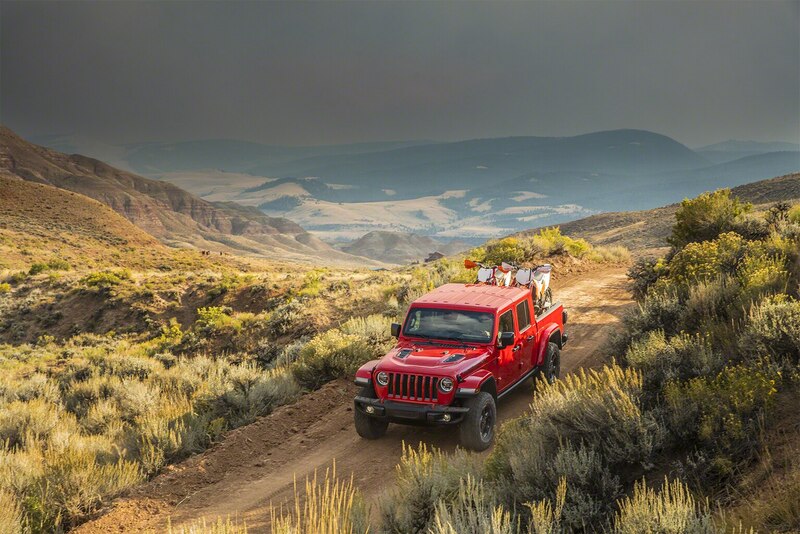 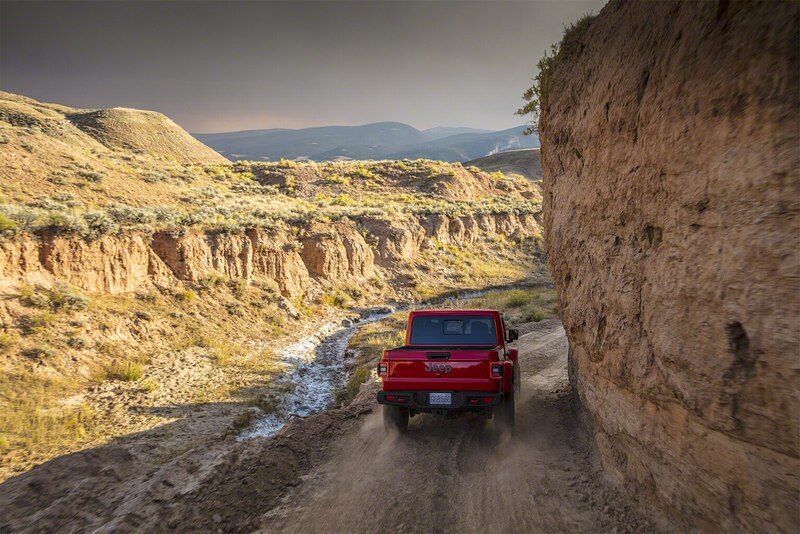 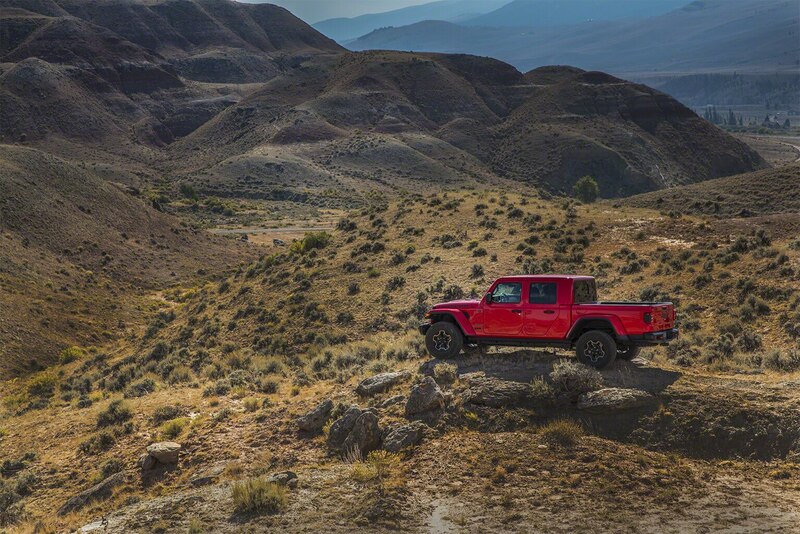 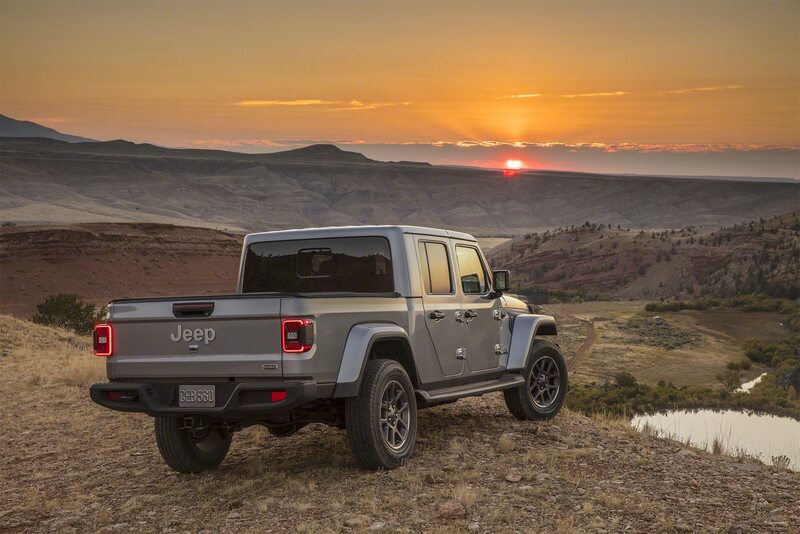 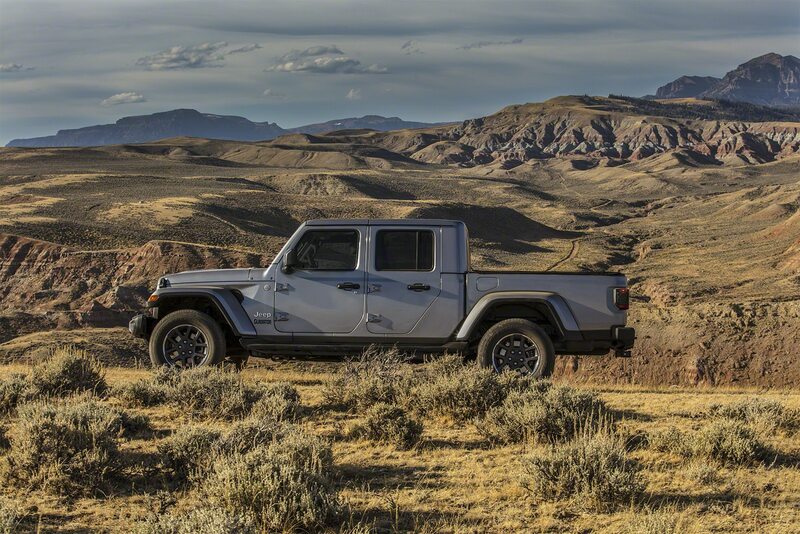 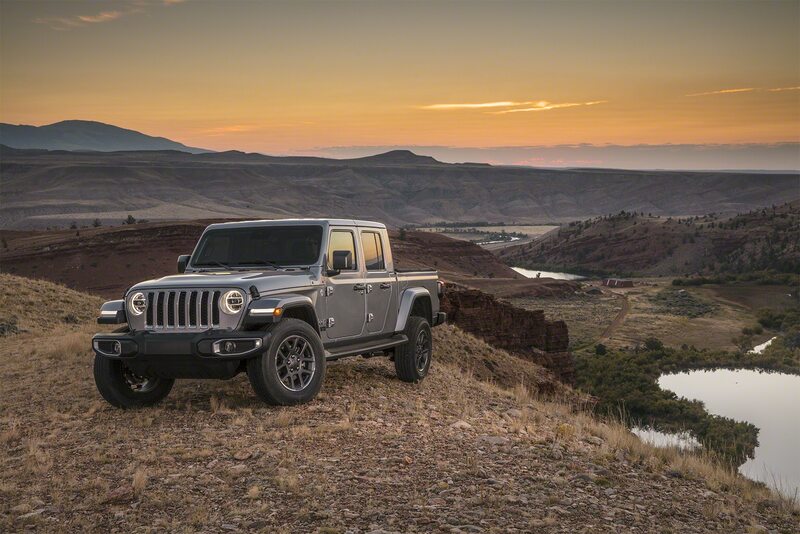 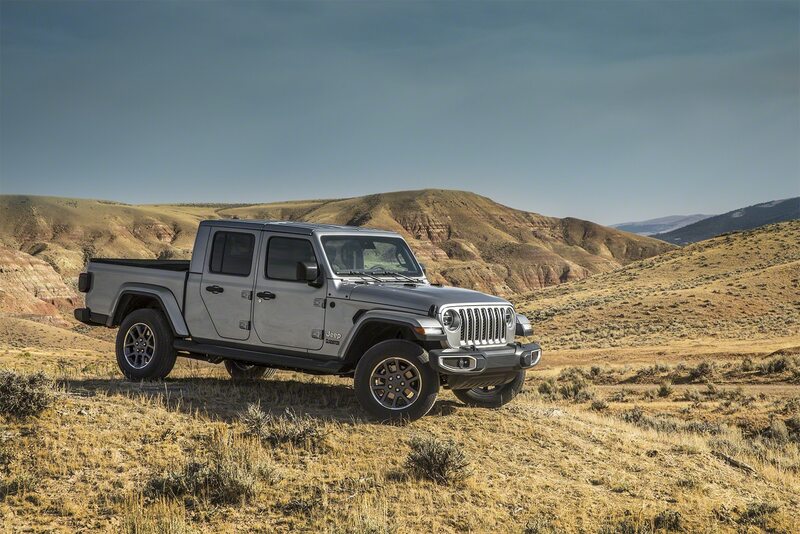 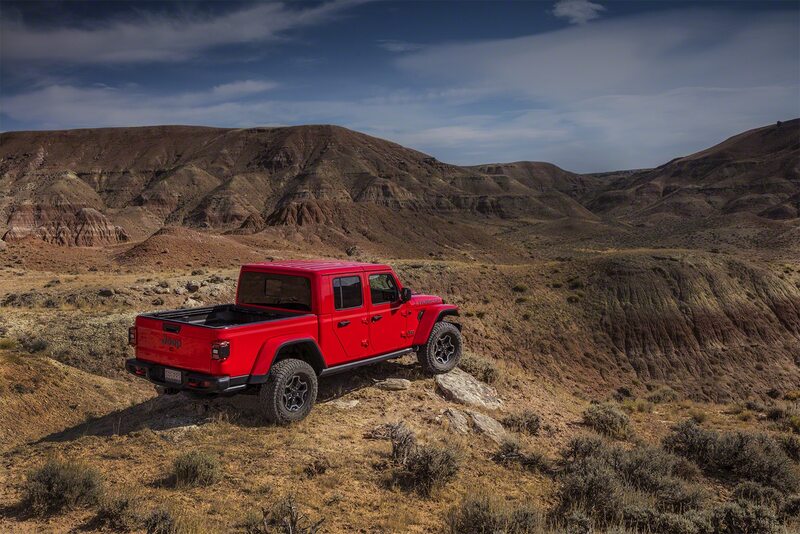 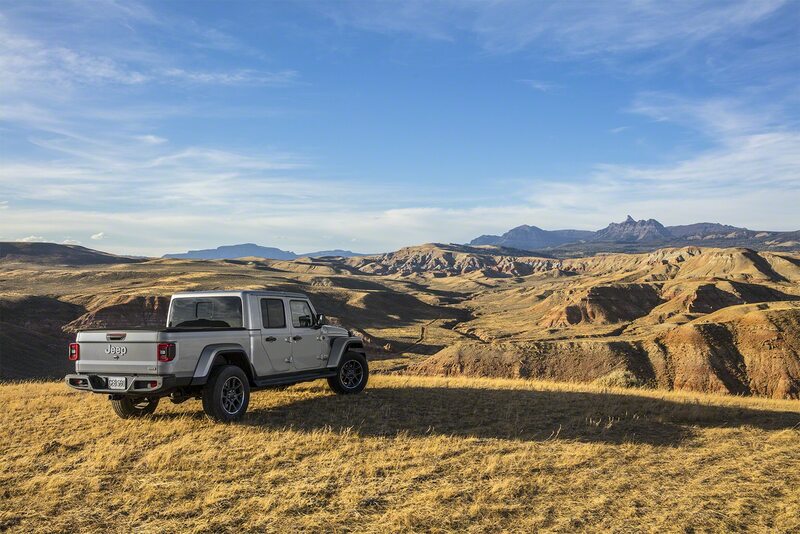 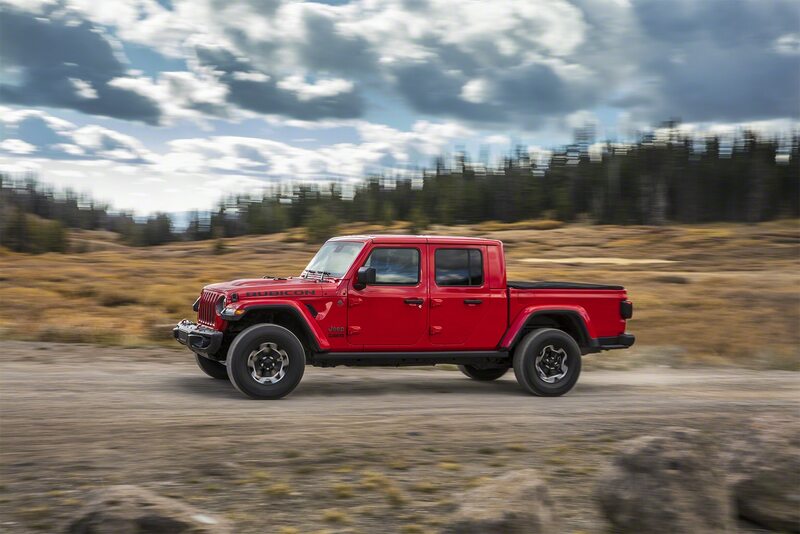 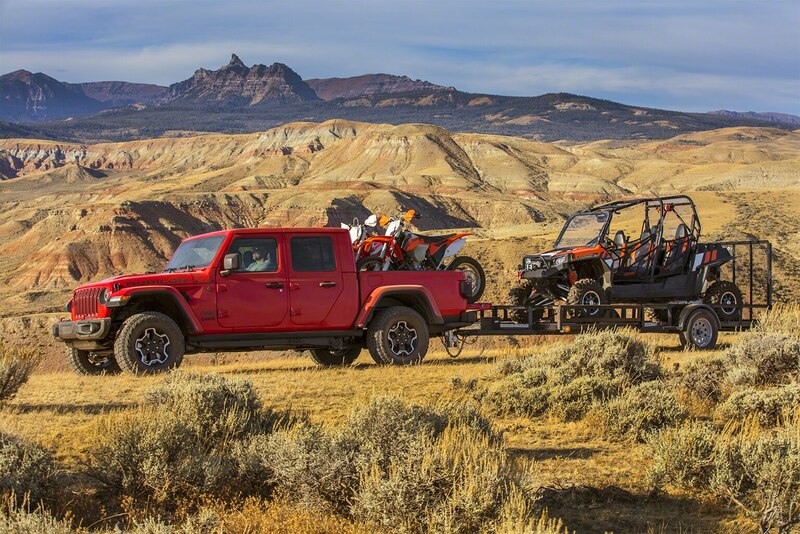 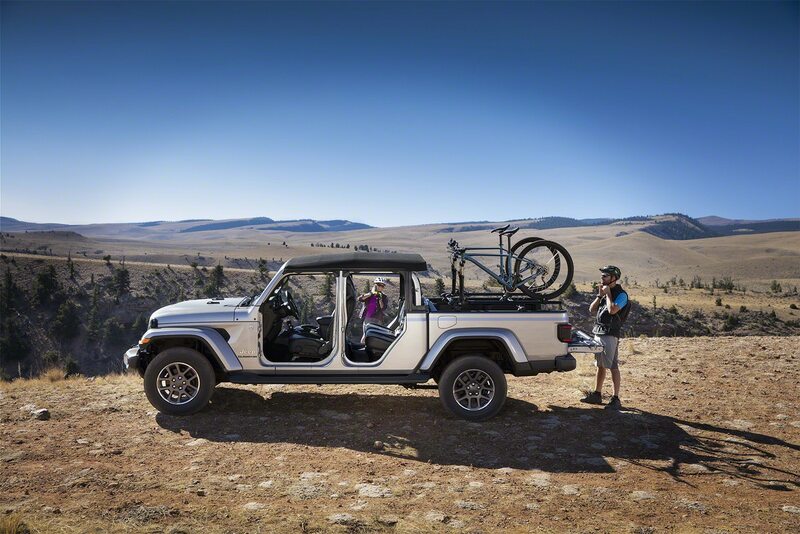 Like the Wrangler and Unlimited, the ’20 Gladiator starts with Sport and then moves to Sport S, but an Overland trim level displaces the Sahara. 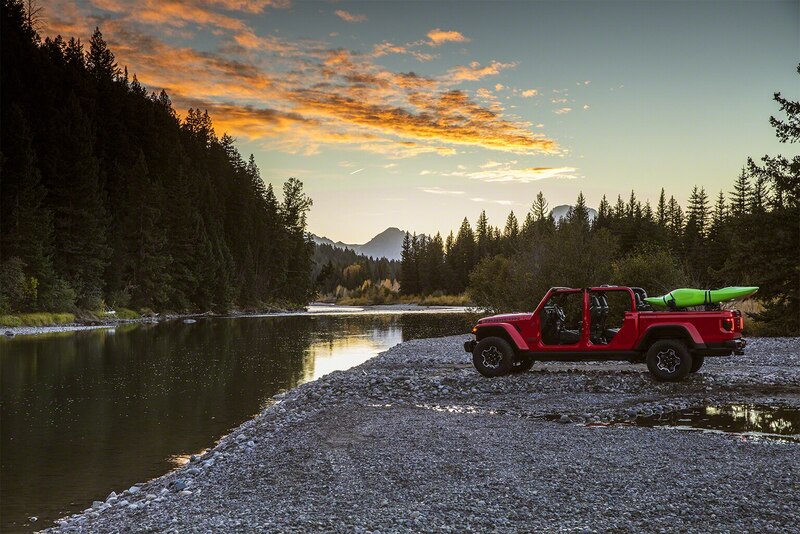 Rubicon is the top trim level here, as it is on the Wrangler. 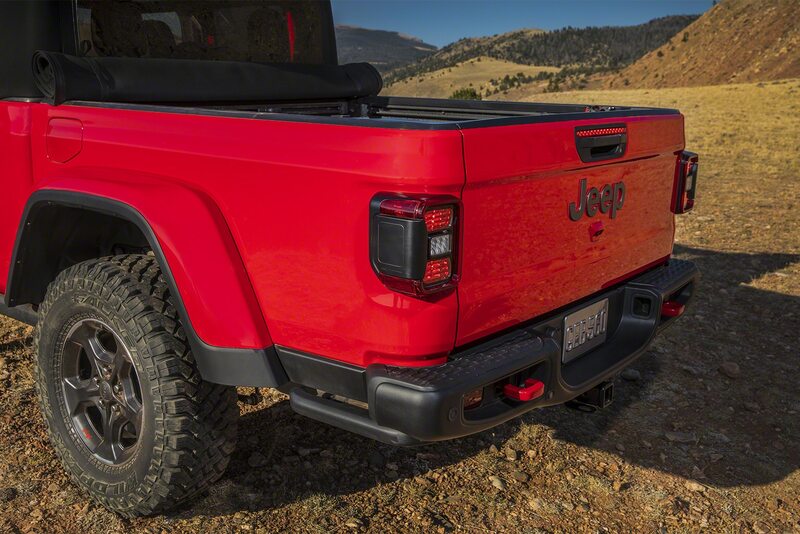 The marque’s first pickup truck since the XJ Cherokee–based 1992 Comanche arrives in the second quarter of next year with specs that should satisfy the brand faithful. 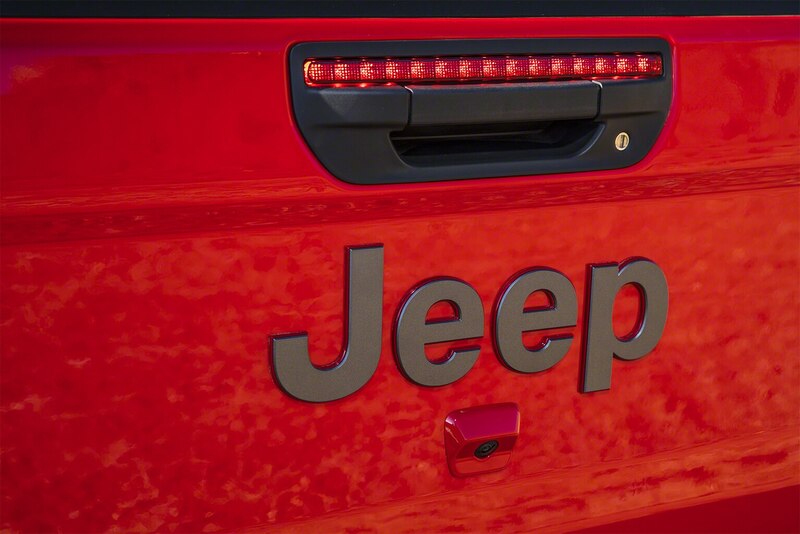 But is there perhaps another reason Jeep is using a model name last affixed to a version of the Wagoneer? 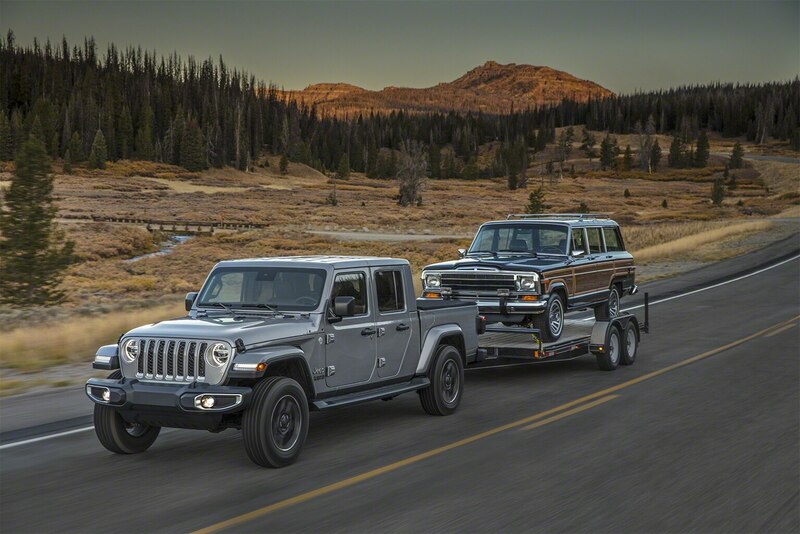 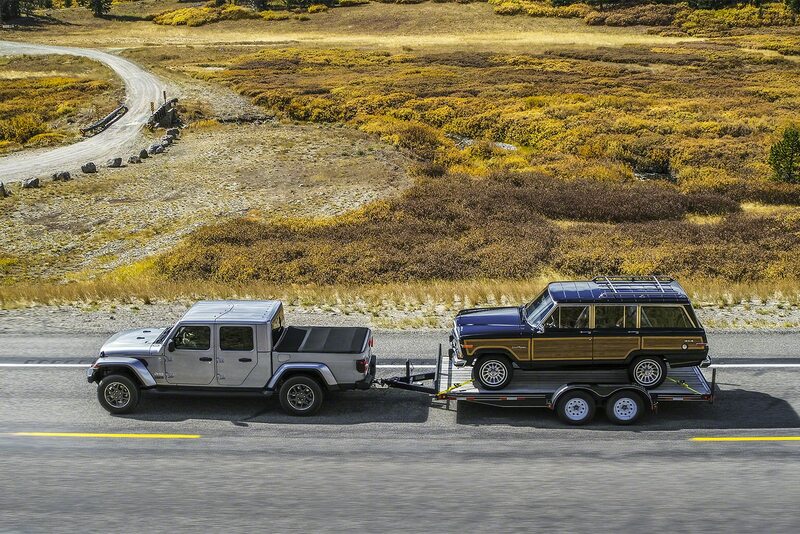 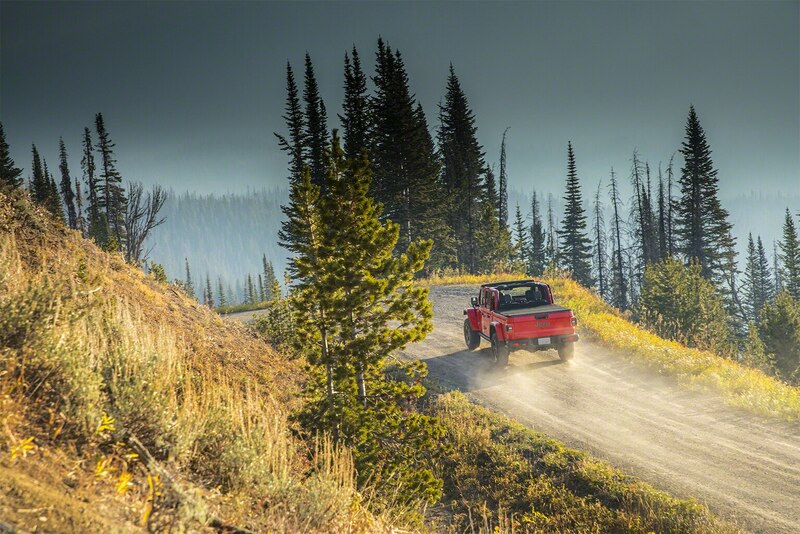 Perhaps because the next eagerly anticipated model from Fiat Chrysler’s off-road brand is a reborn Wagoneer, which will also be built on a version of the platform used for the Ram 1500 pickup truck.